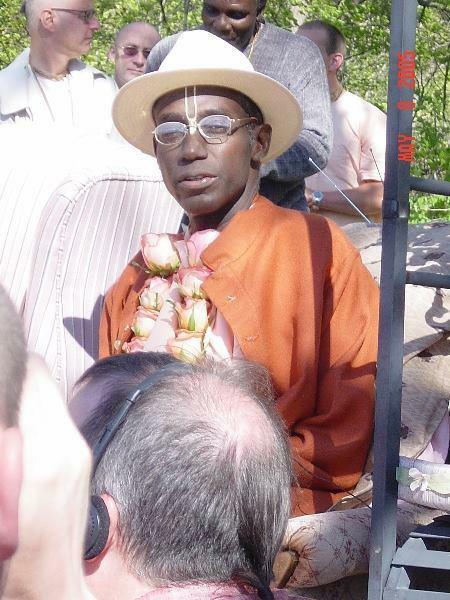 Bhakti Tirtha Swami was born John Edwin Favors on February 25, 1950 into a poor Christian family living in Cleveland, Ohio. 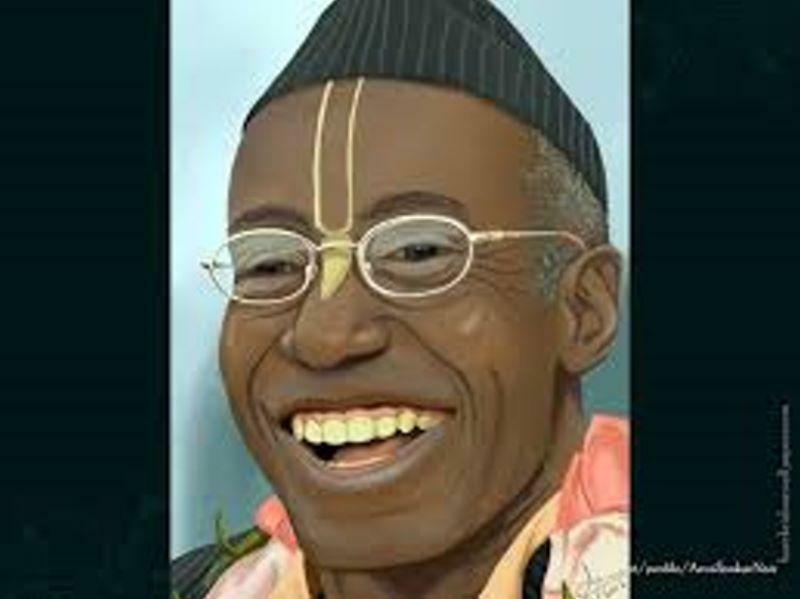 His parents instilled in him the values of self-confidence, religiosity and a spirit of generosity demonstrated by giving to persons less fortunate than others. 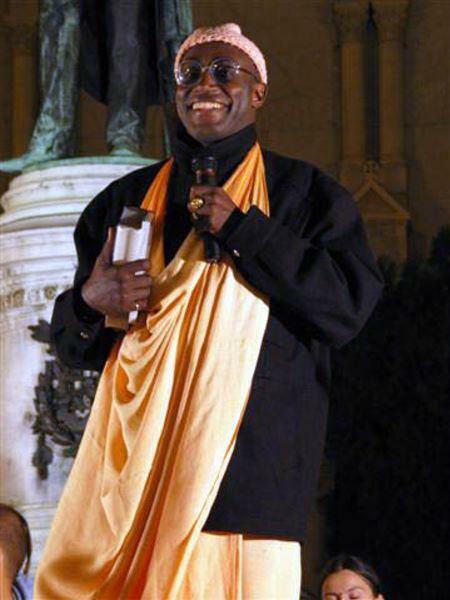 As a child, John Favors appeared on television to preach Christianity. 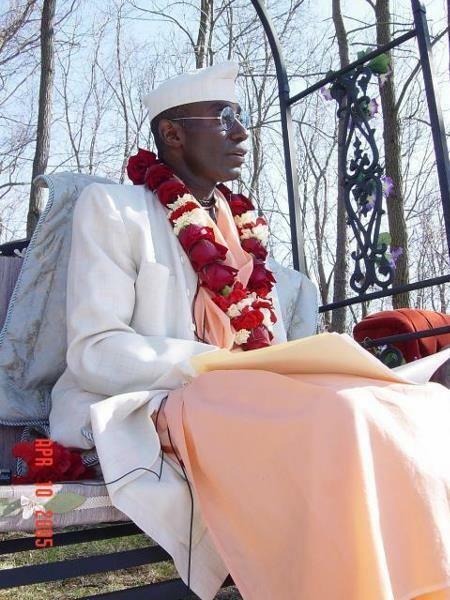 He excelled in his academic achievements while attending East Technical High School in Cleveland and received ascholarship to attend the prestigious Hawken School, where he spent an additional year of college preparation in philosophy and political science. 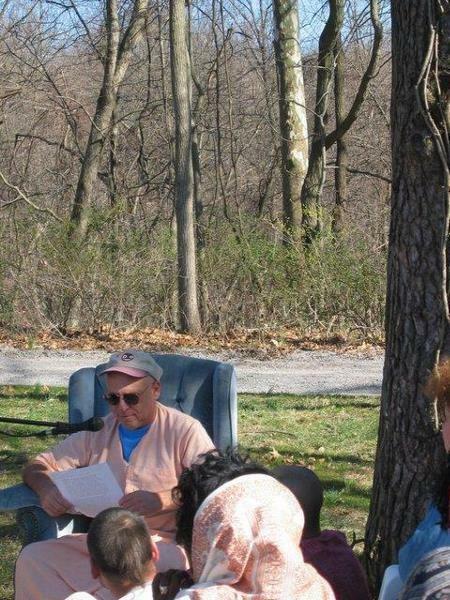 While at Hawken, he was a member of the football andwrestling teams. 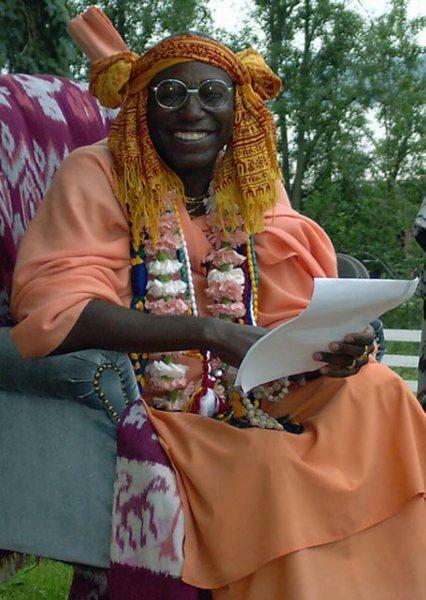 In 1968 he came to Princeton University. 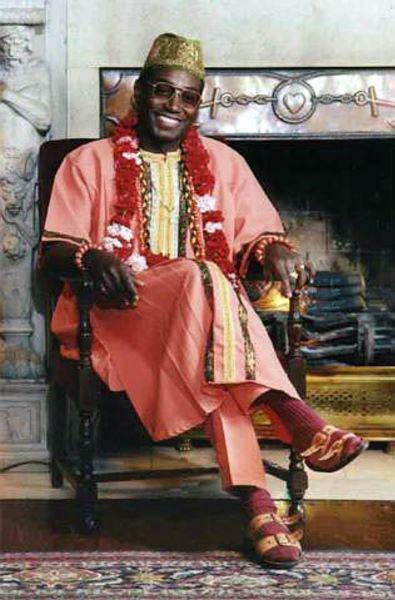 While at Princeton, he was a leader in Martin Luther King's civil rights movement being "at the forefront of political activism on campus, a leader of the Association of Black Collegians (ABC) and a founder of the Third World Center". 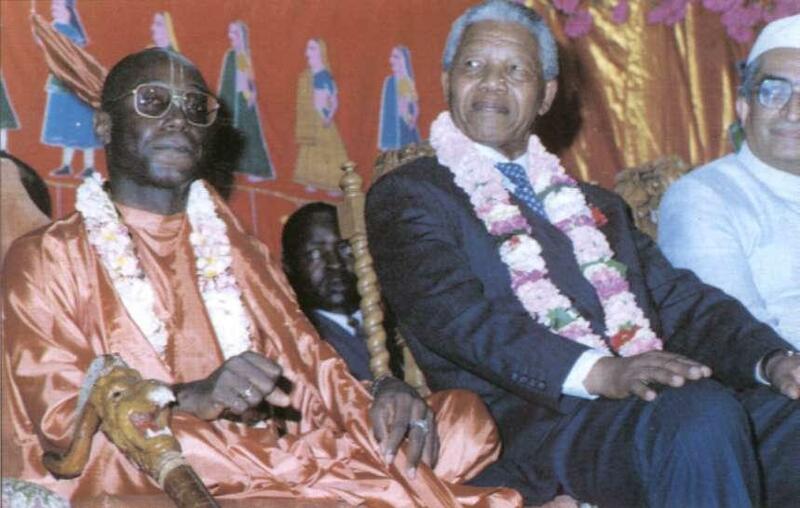 He also served as a president of the student council. 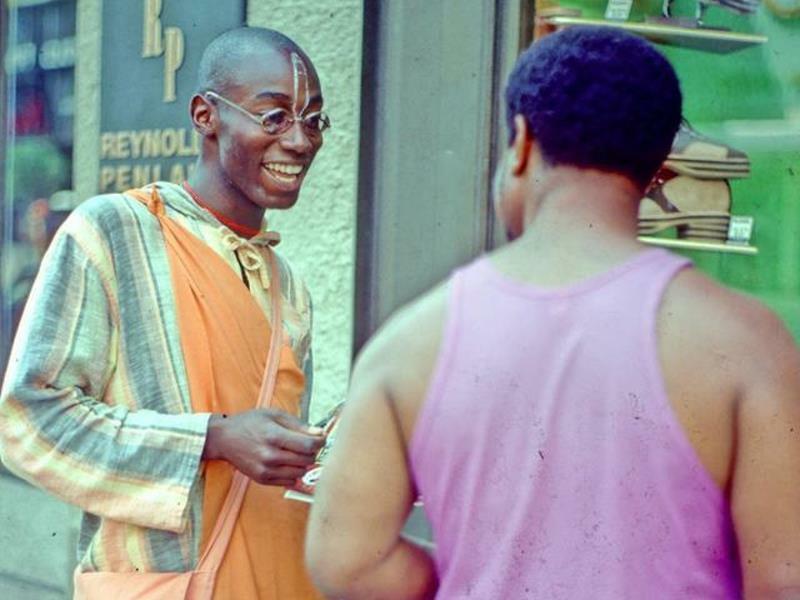 In 1972, he earned a B.A. 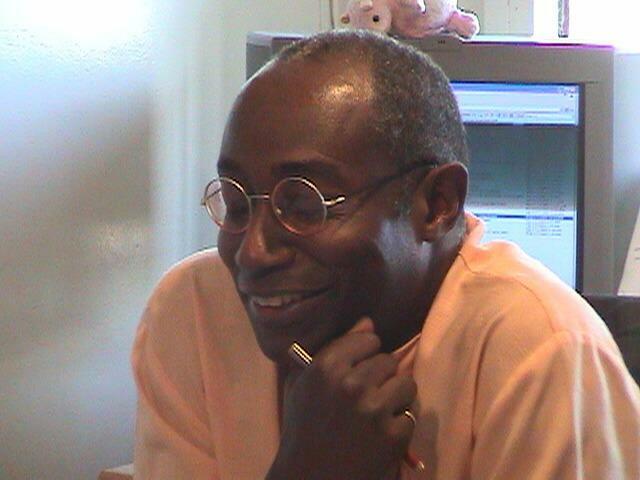 in psychology and African American studies. 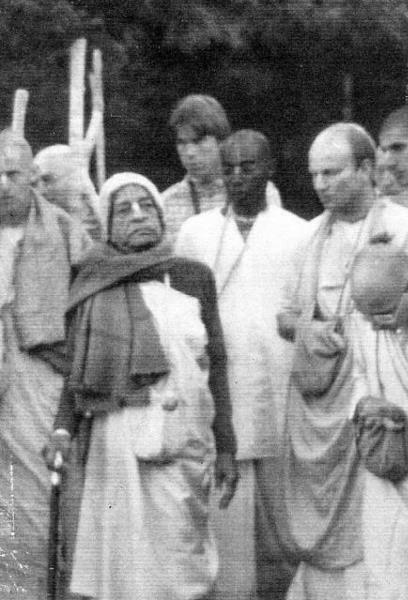 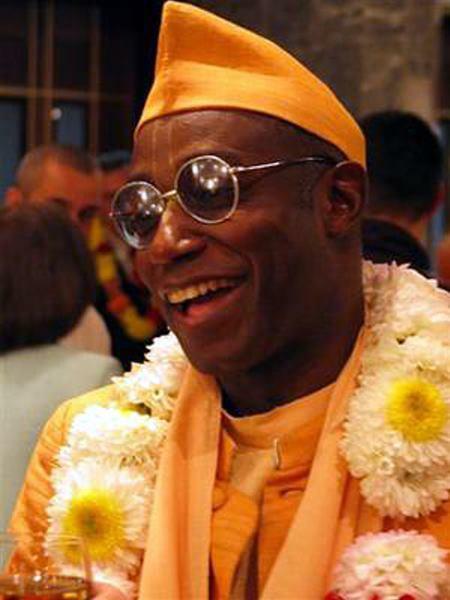 After Princeton, he joined the Hare Krishna Movement and "began a career of worldwide travel, study, teaching, lecturing, and writing". 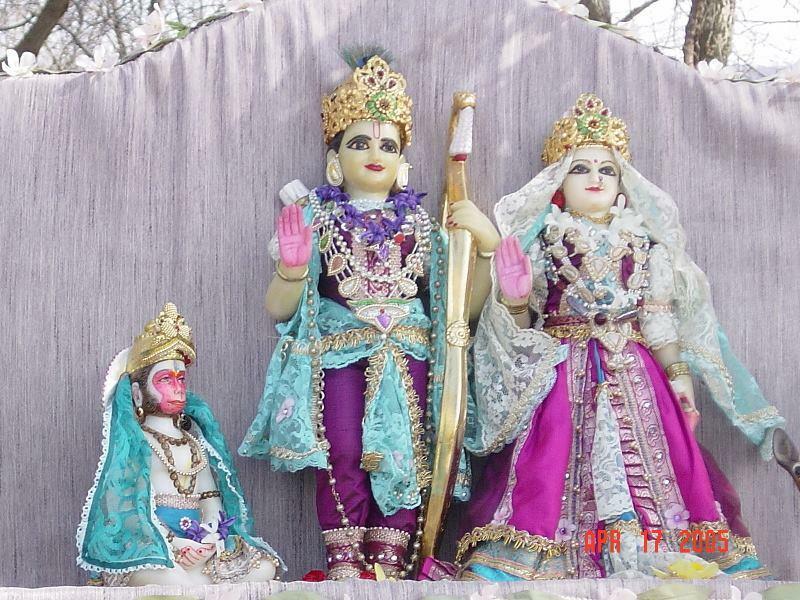 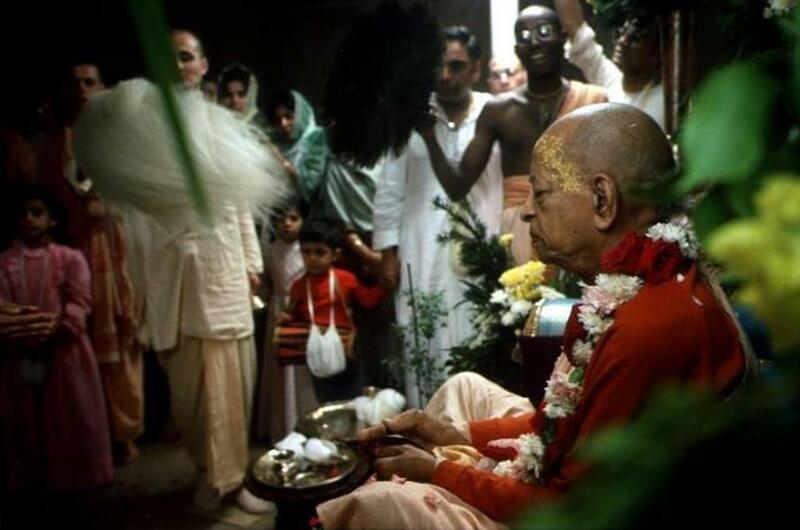 On February 16, 1973 in Los Angeles he was initiated into the Gaudiya Vaishnava tradition by ISKCON's founder A. C. Bhaktivedanta Swami Prabhupada, whereupon he was given the name Ghanashyam Dasa (meaning servant of Krishna). 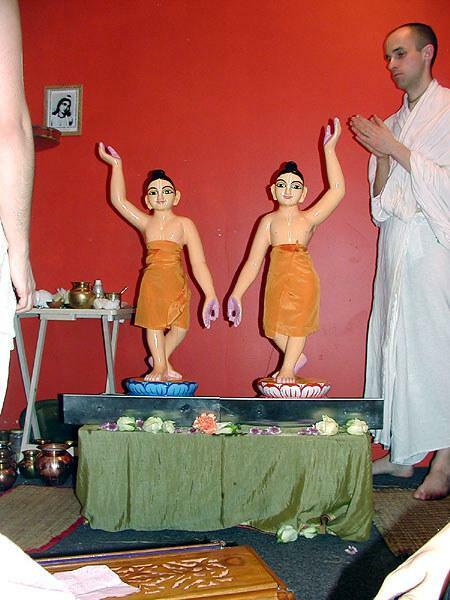 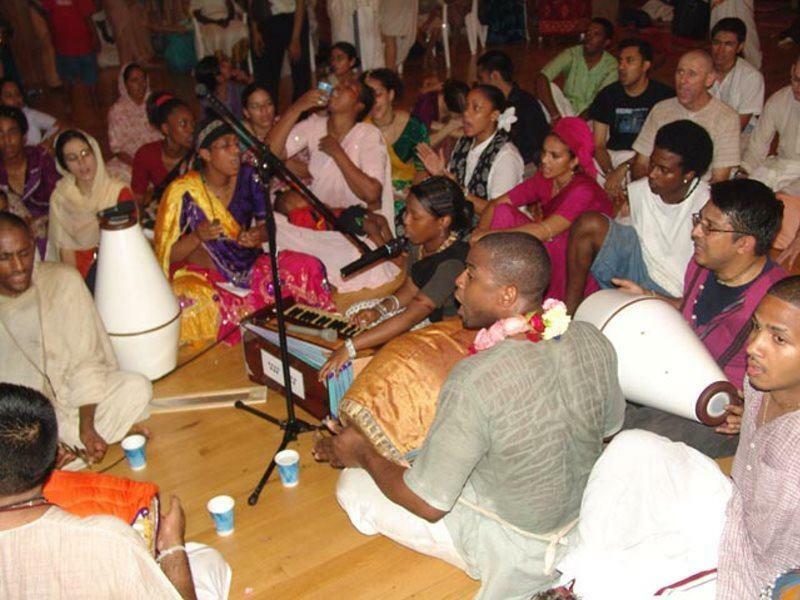 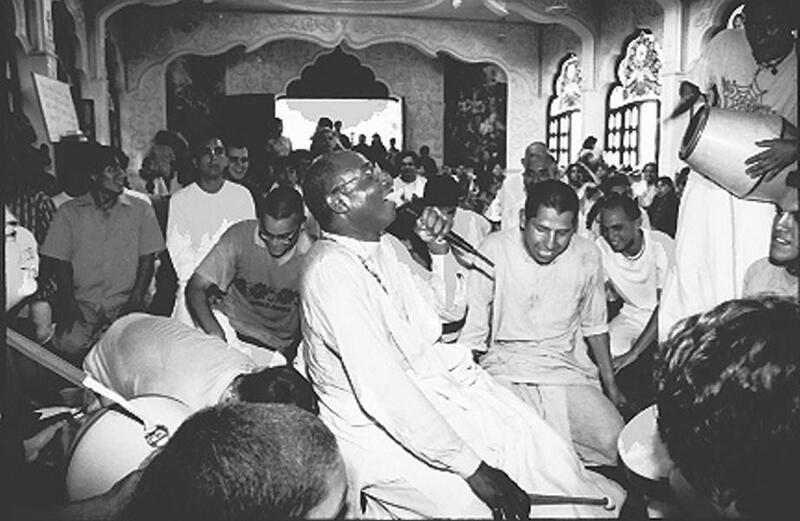 In the 1970s, Ghanashyam Dasa preached Gaudiya Vaishnavism in Eastern Europe by distributing religious books and working with scholars. 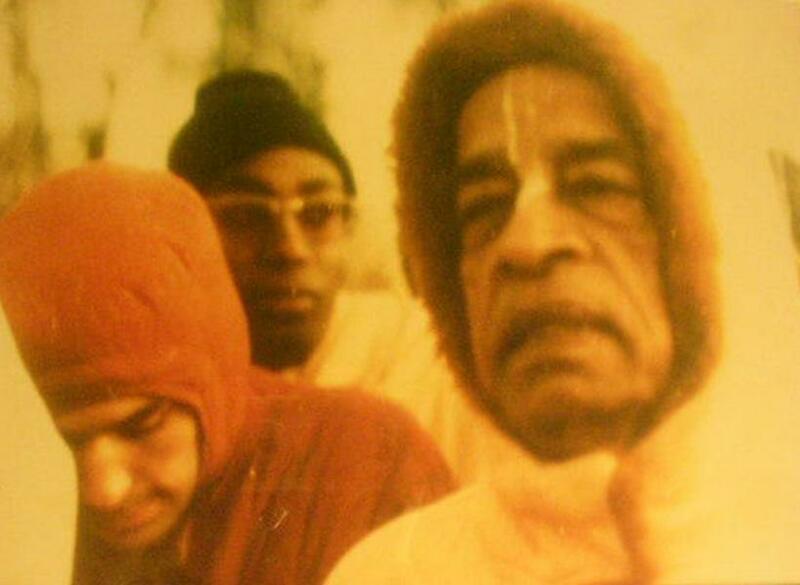 On March 13, 1979 during Gaura-purnima festival at New Vrindaban, he was initiated into the Vaishnava sannyasa order of renunciation by Kirtanananda Swami and given the name Bhakti Tirtha Swami. 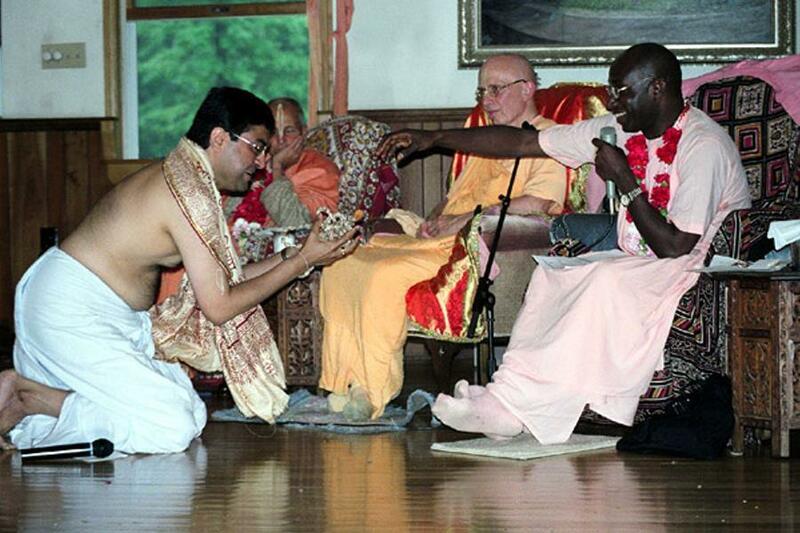 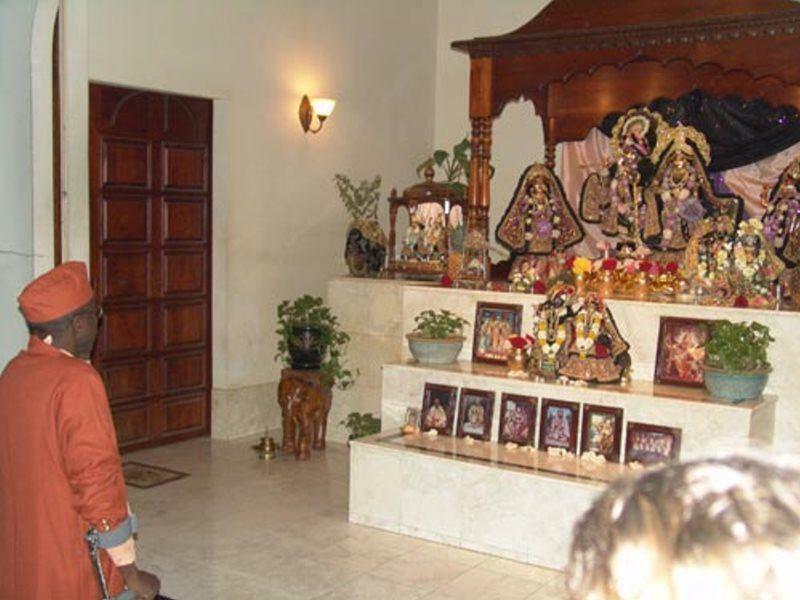 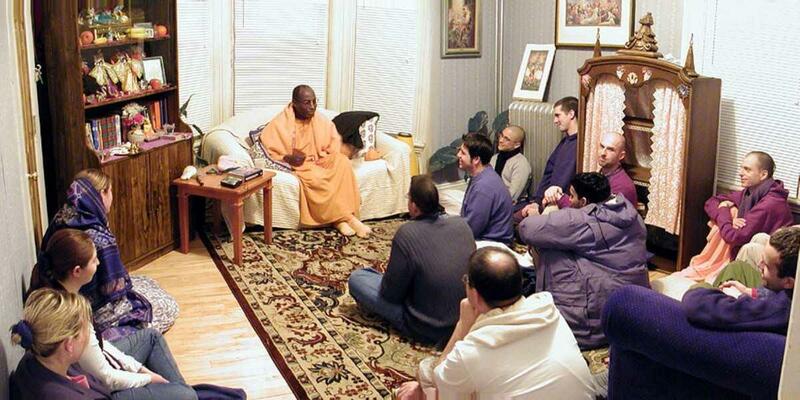 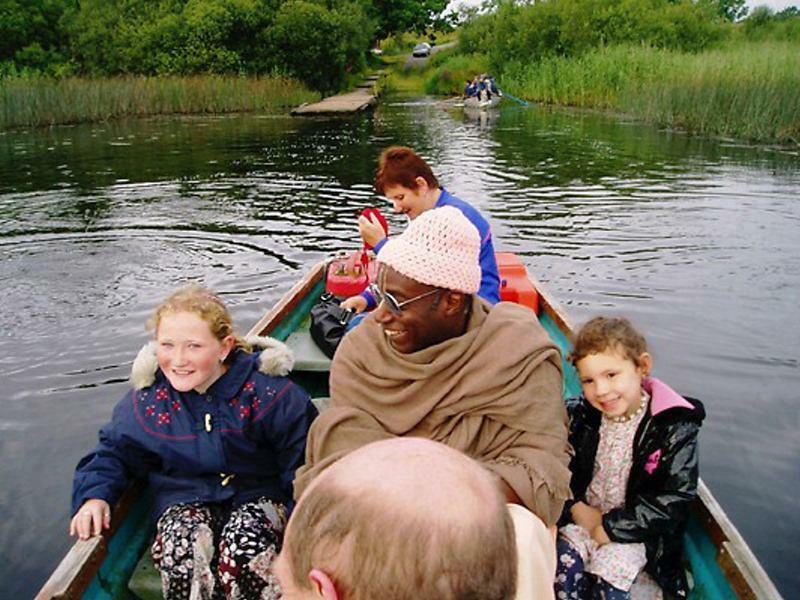 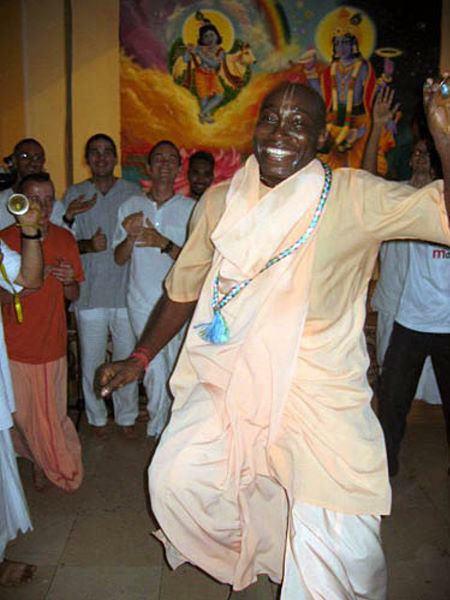 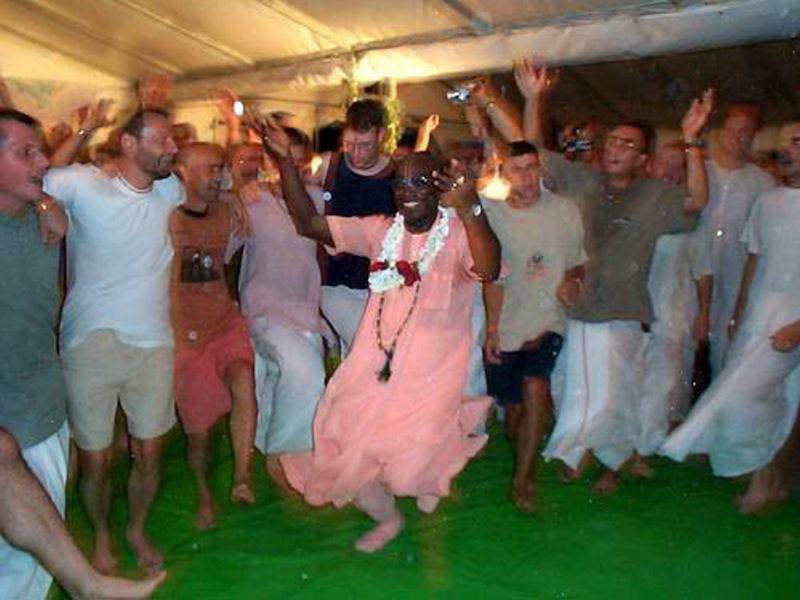 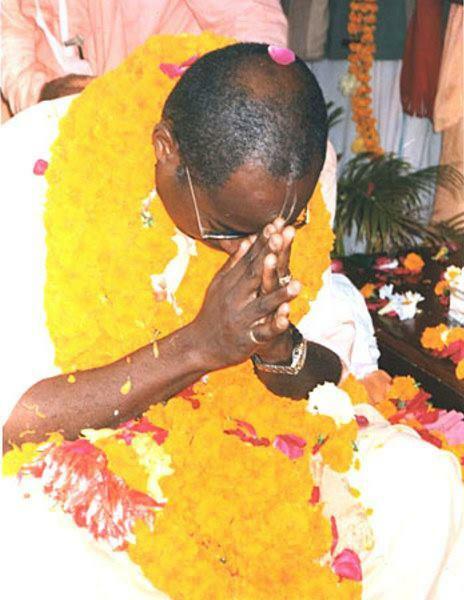 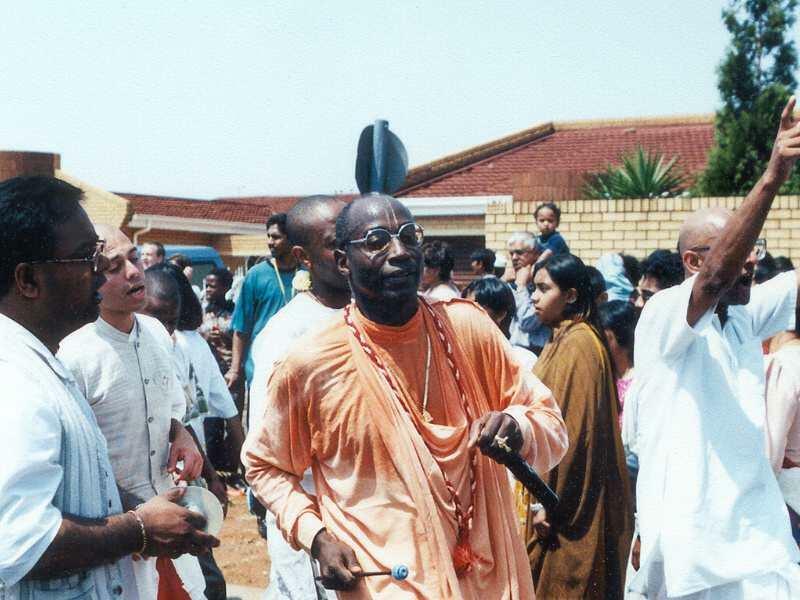 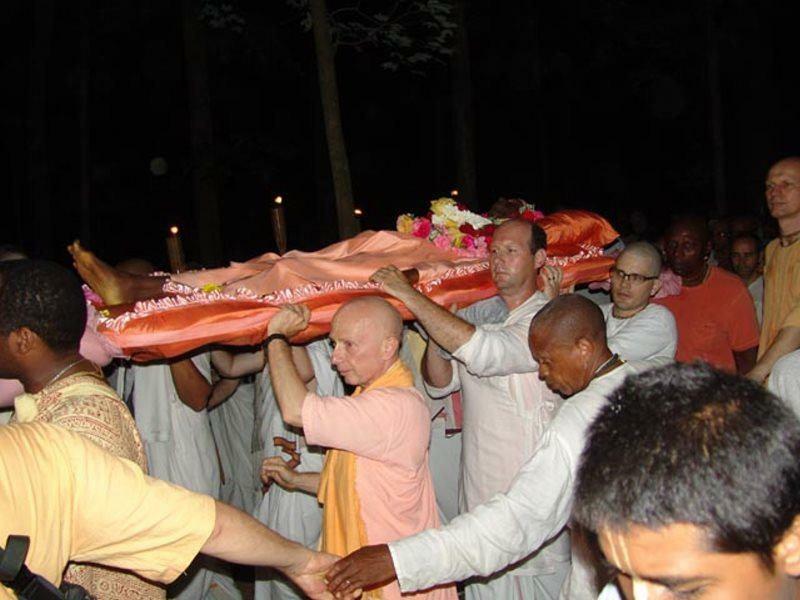 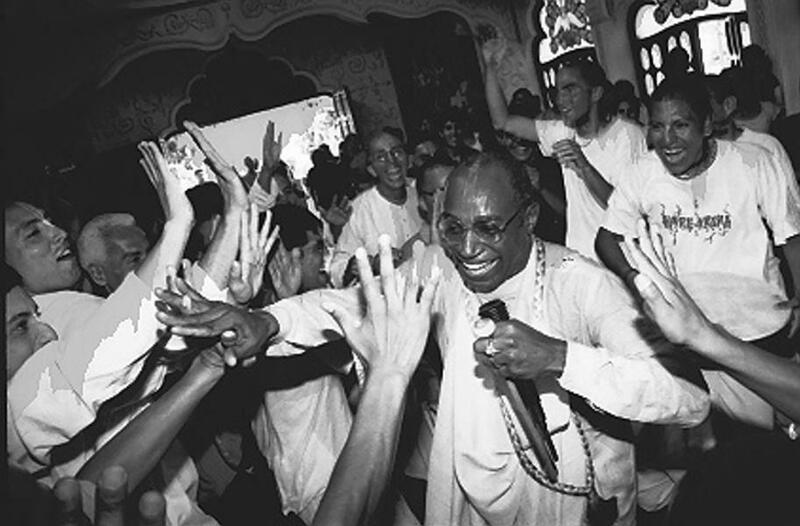 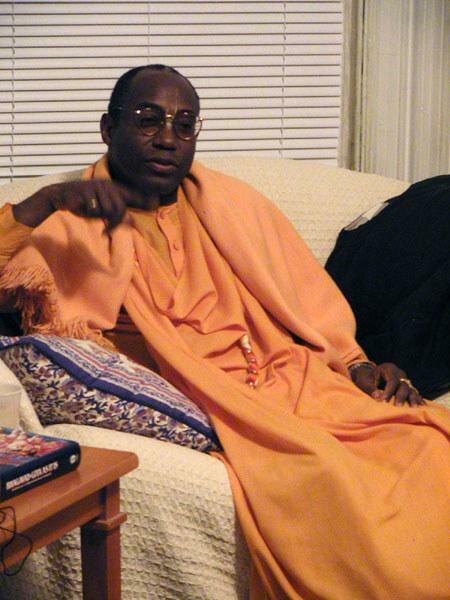 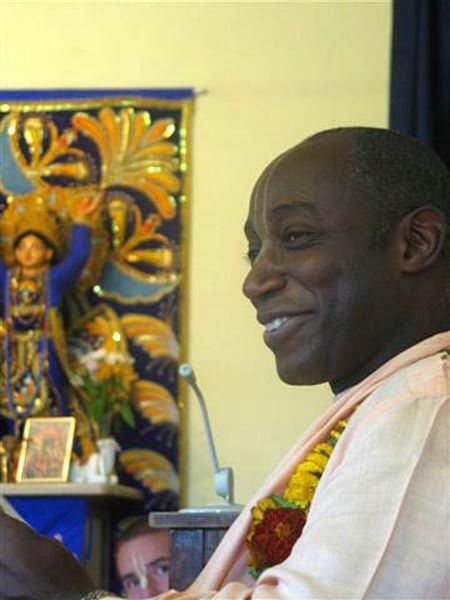 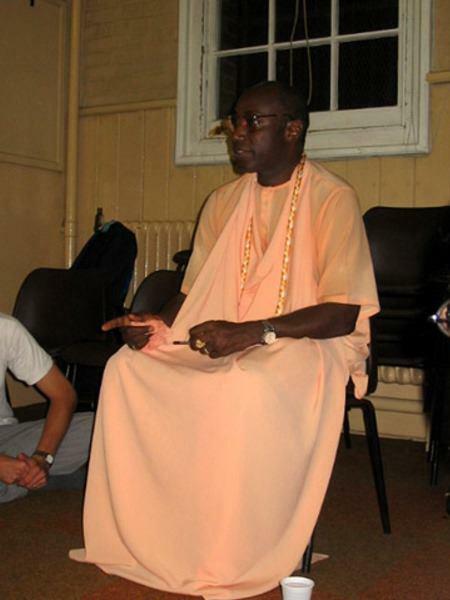 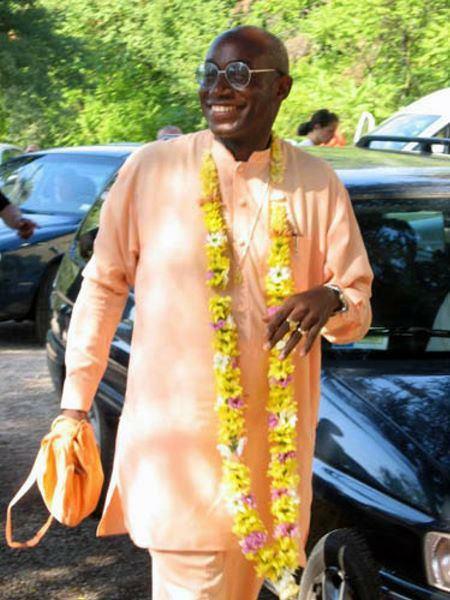 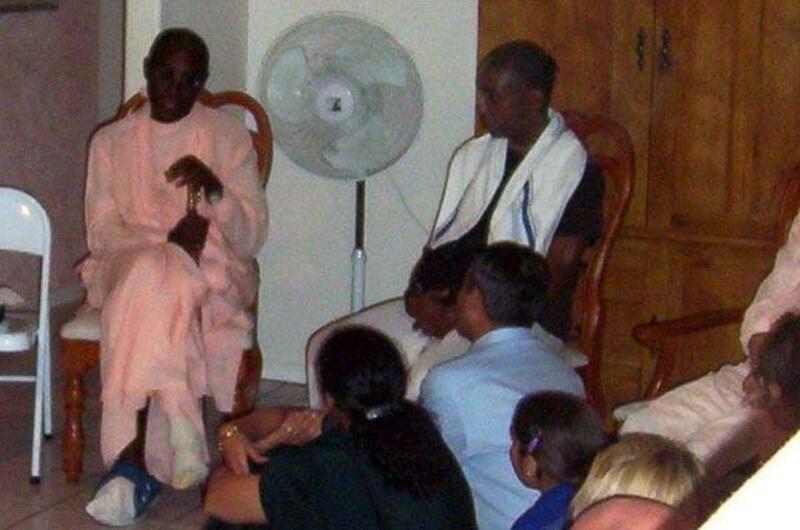 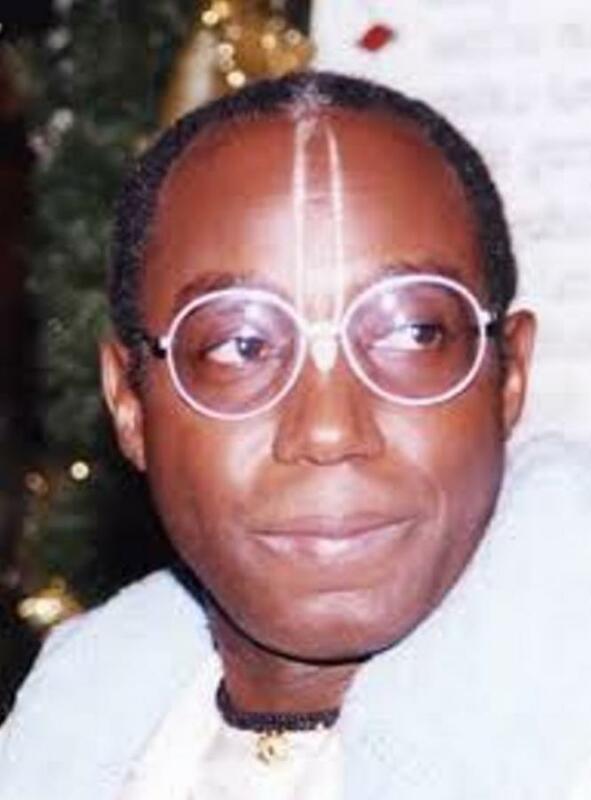 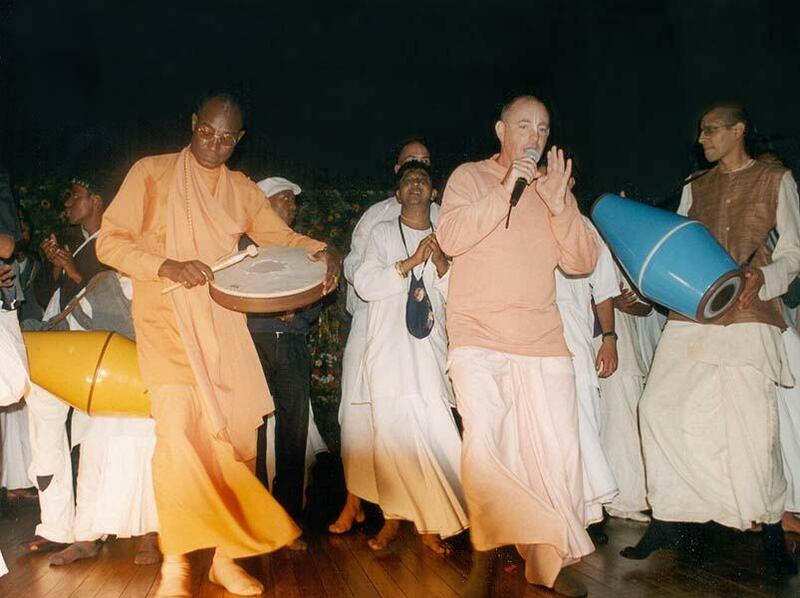 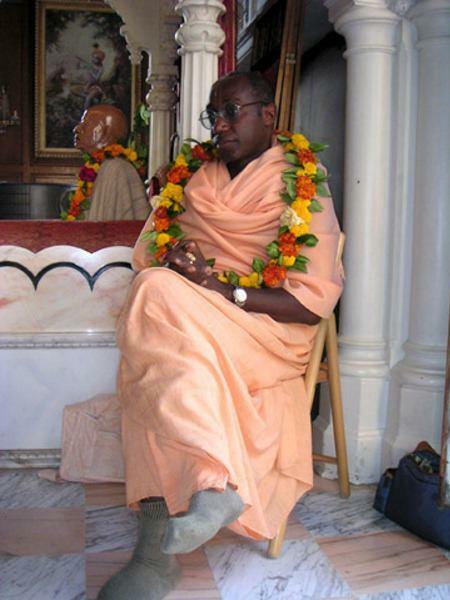 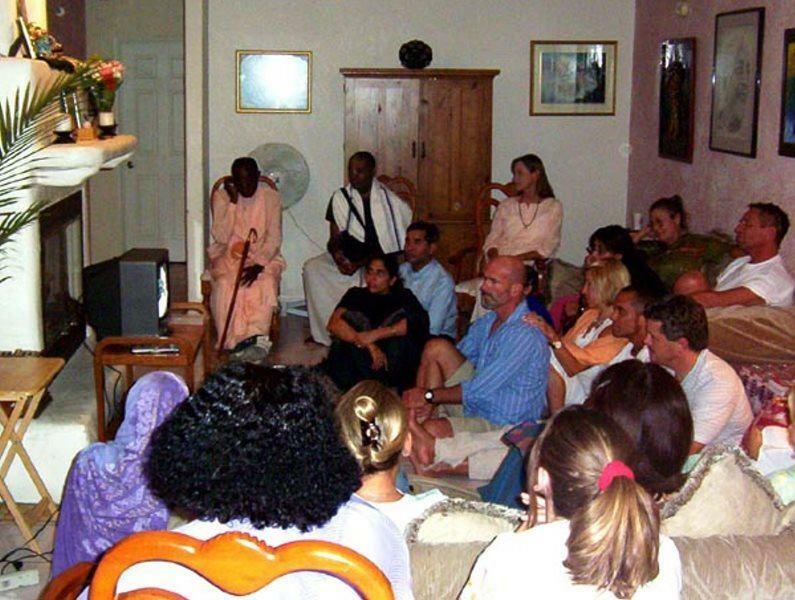 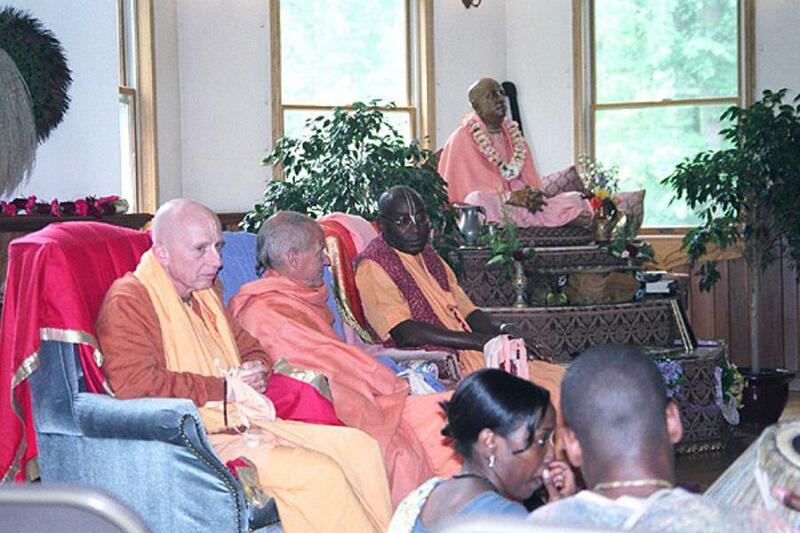 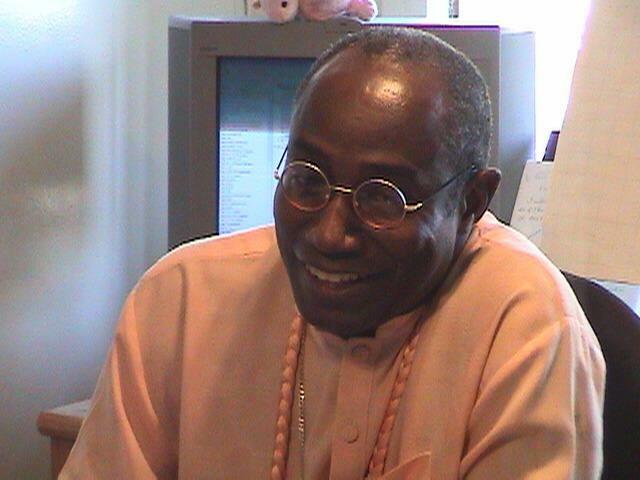 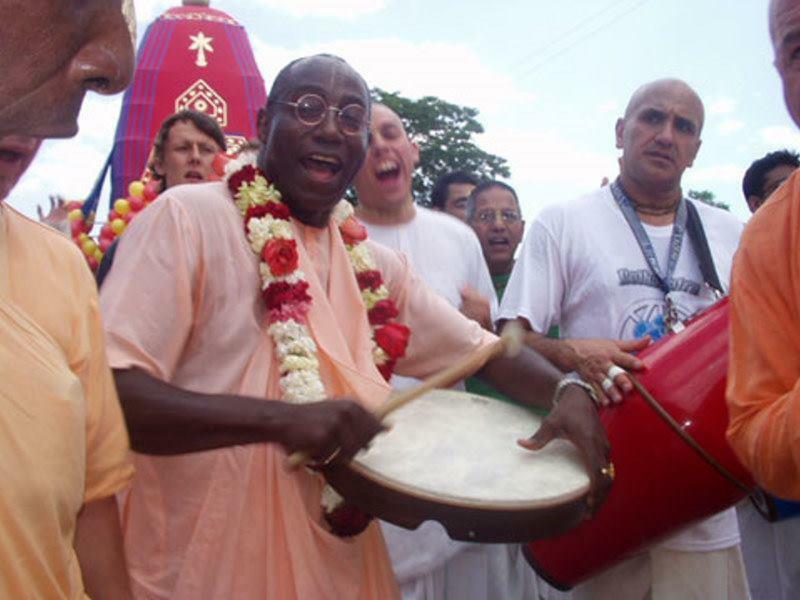 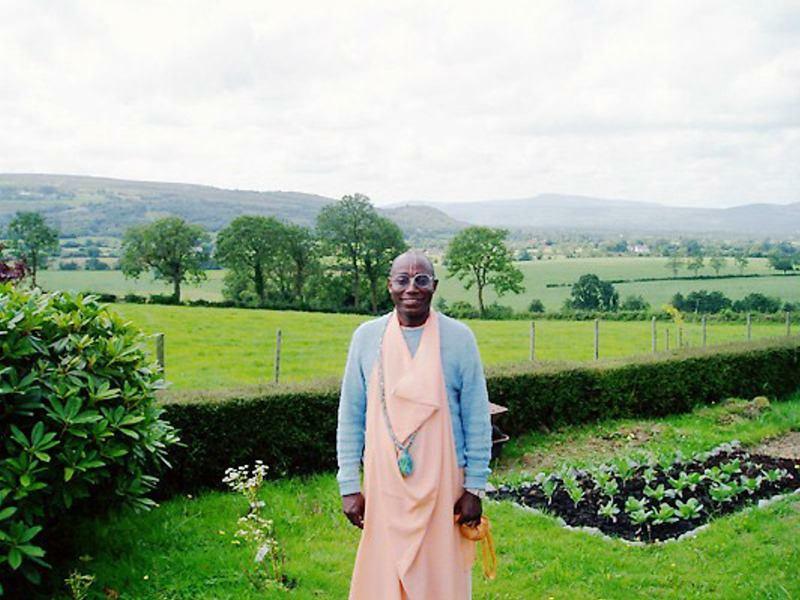 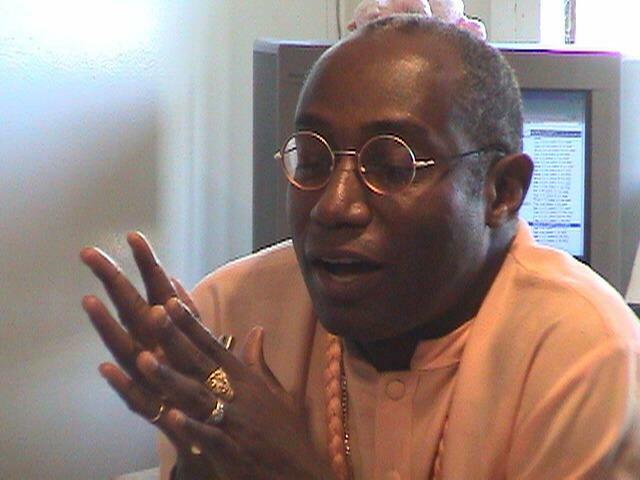 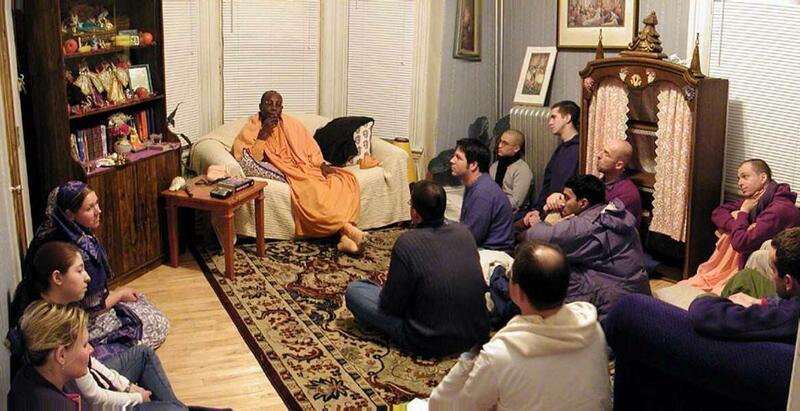 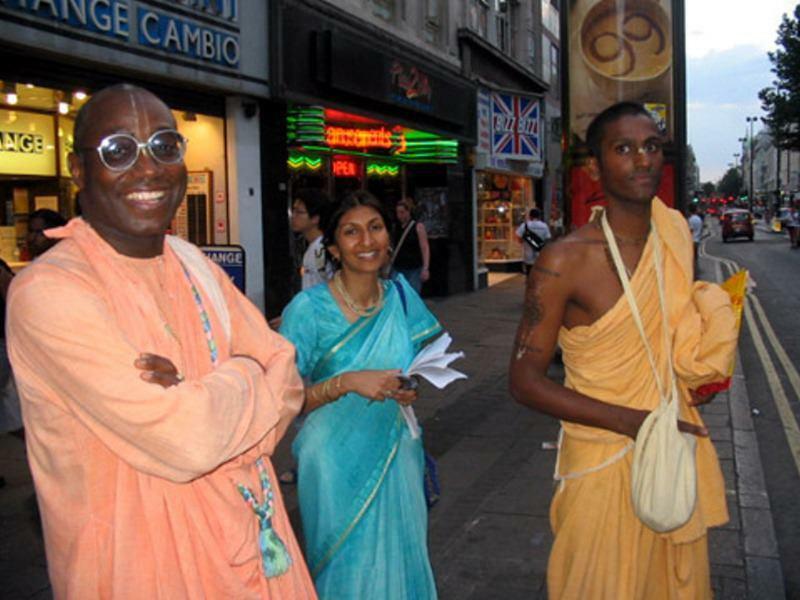 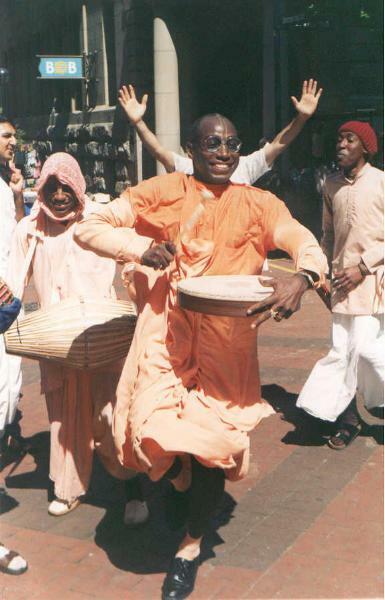 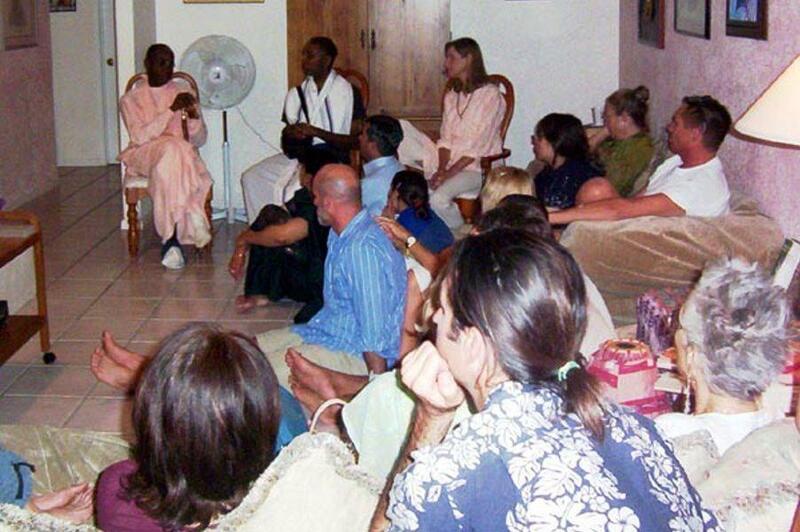 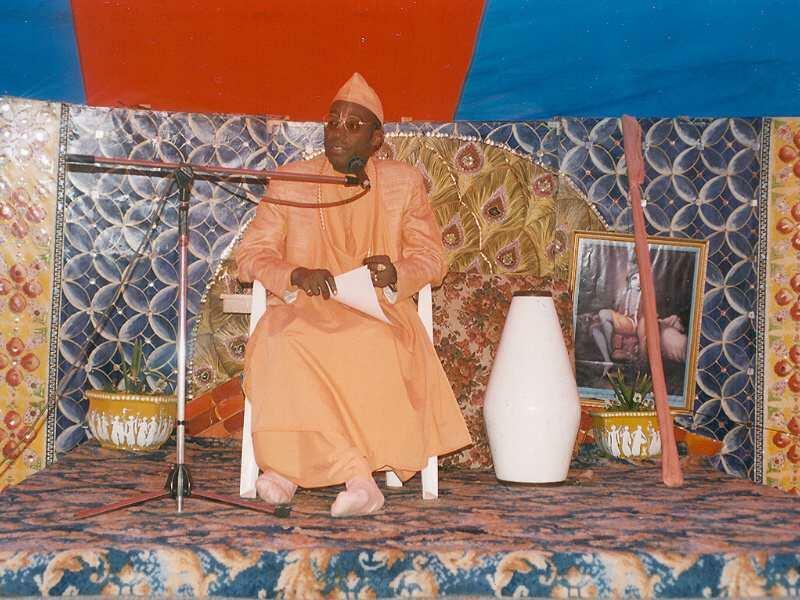 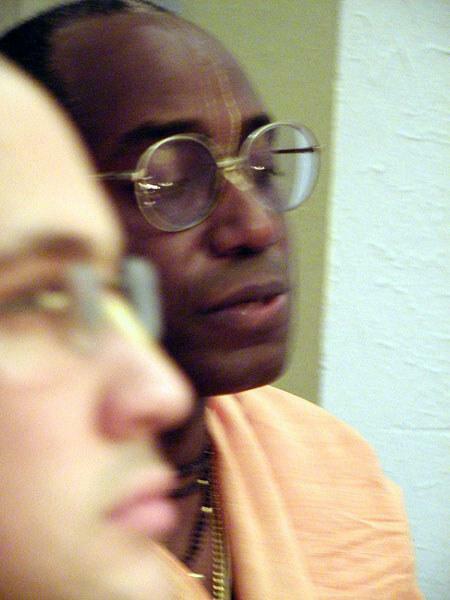 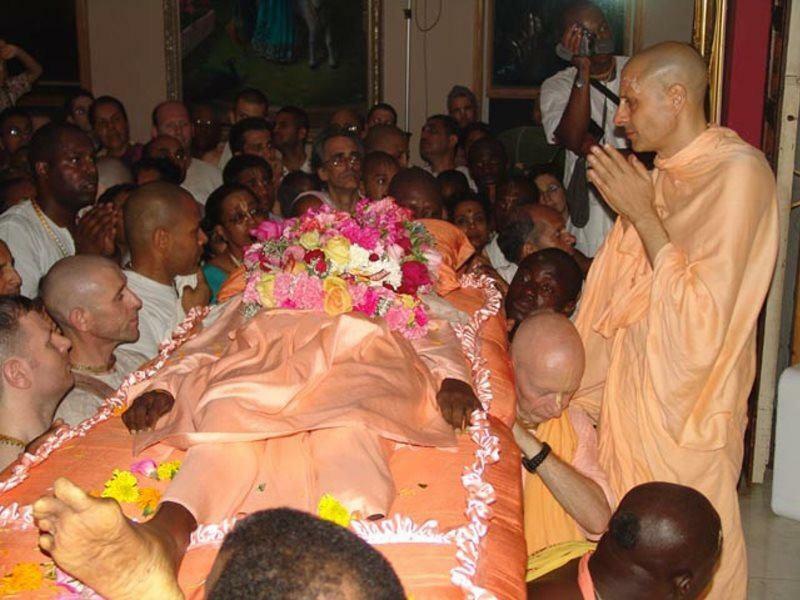 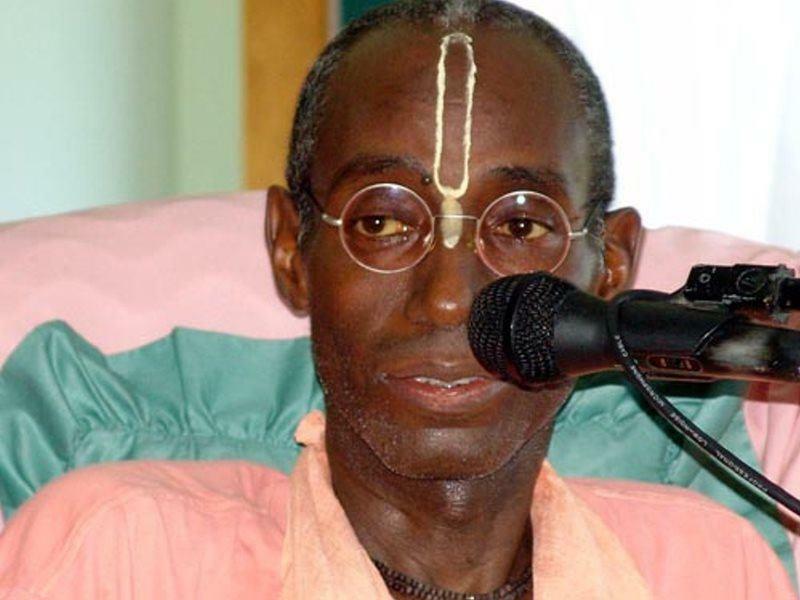 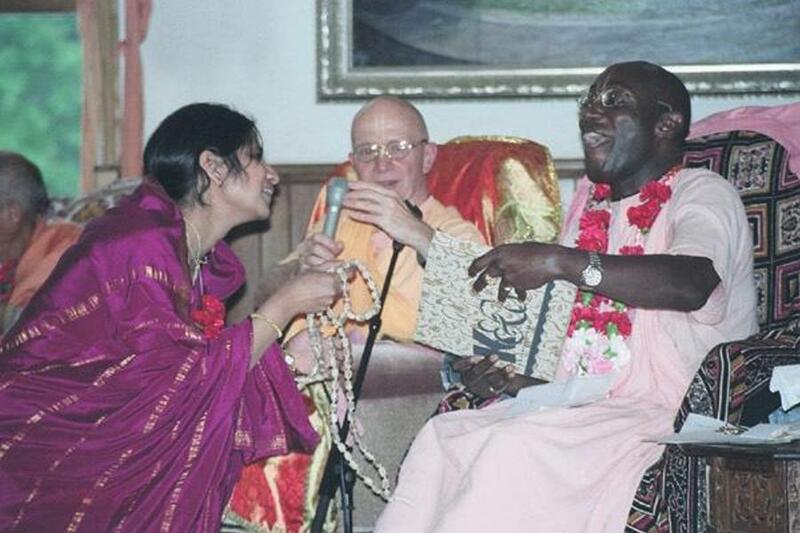 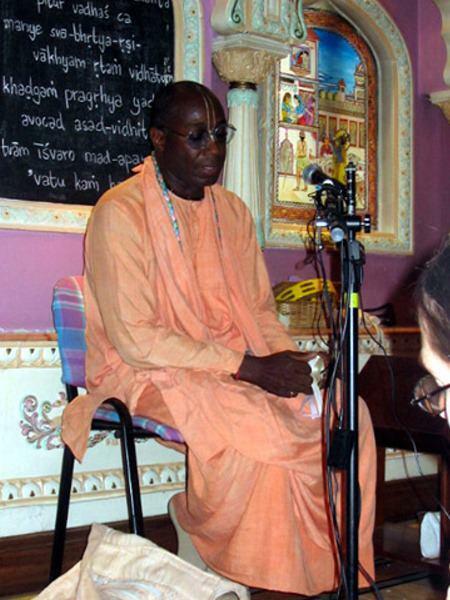 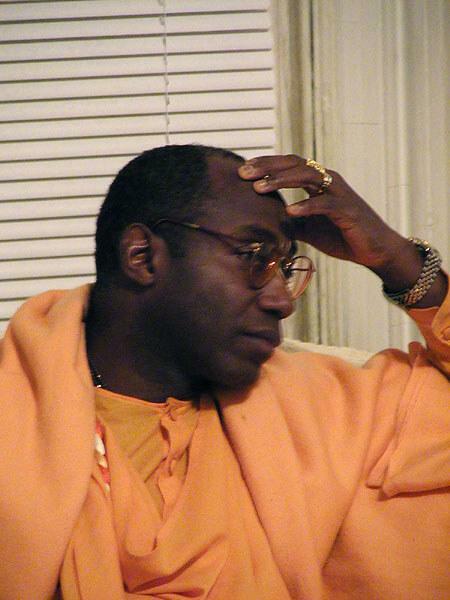 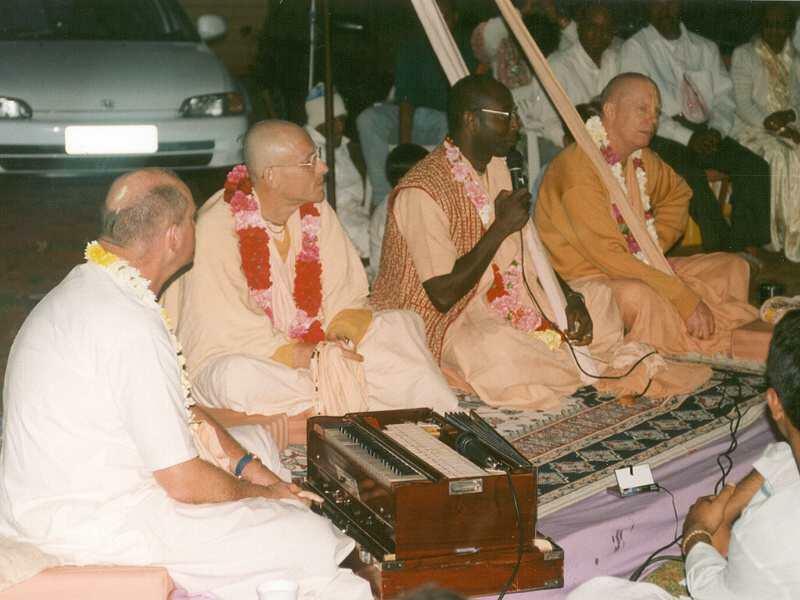 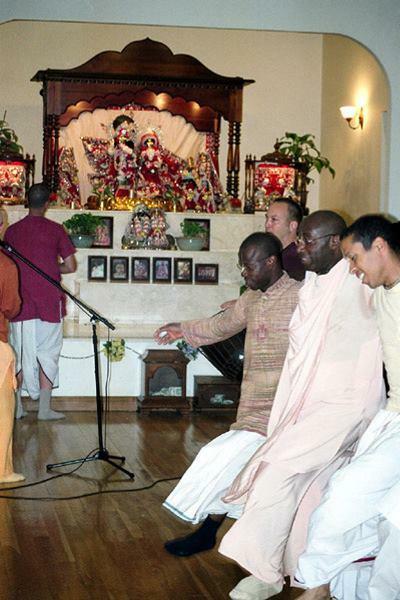 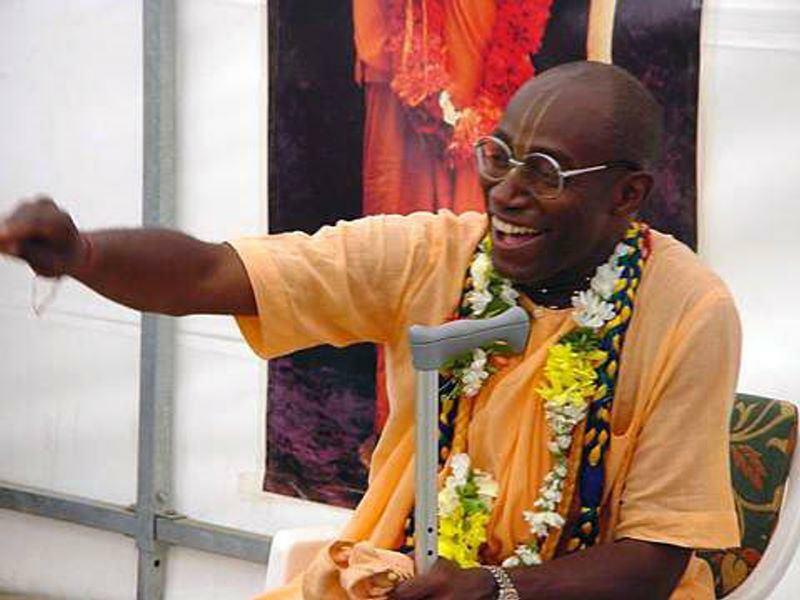 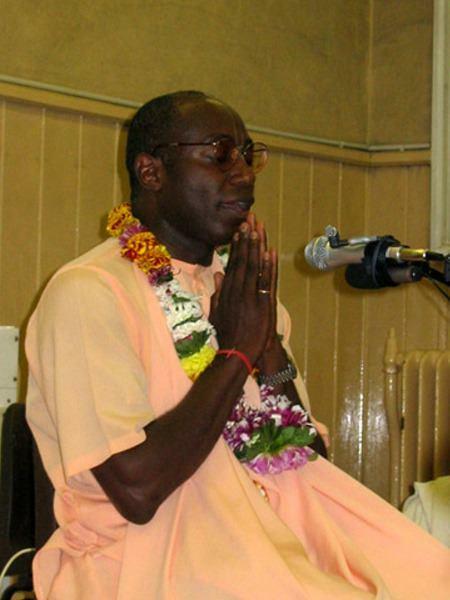 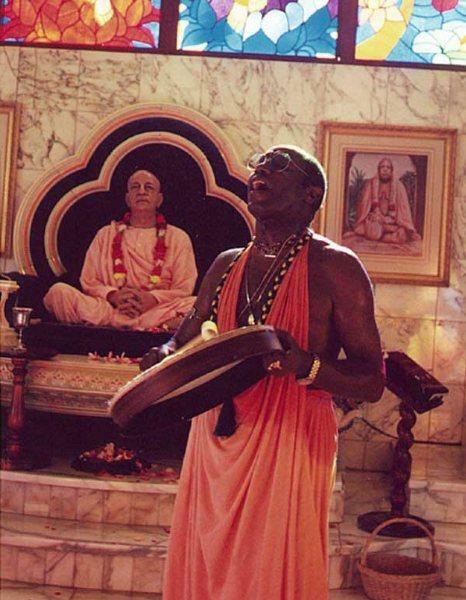 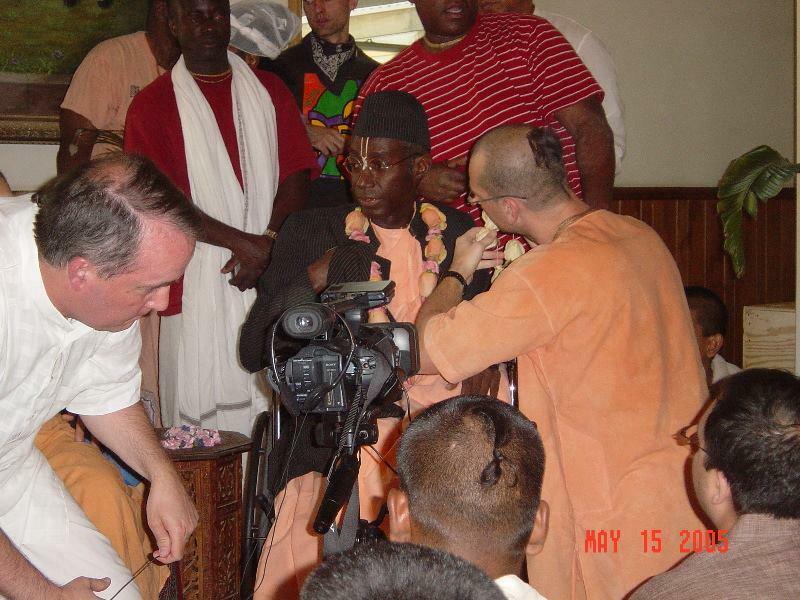 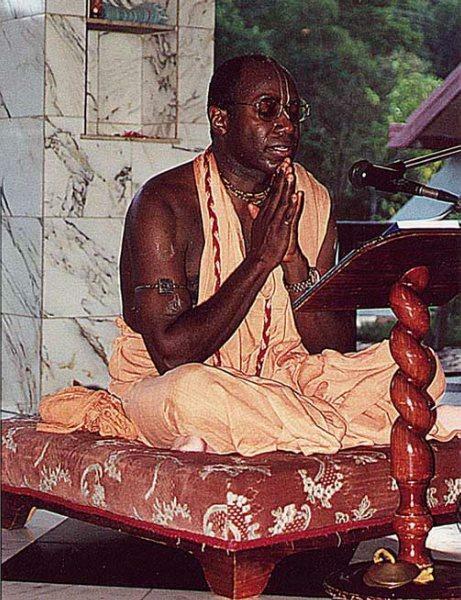 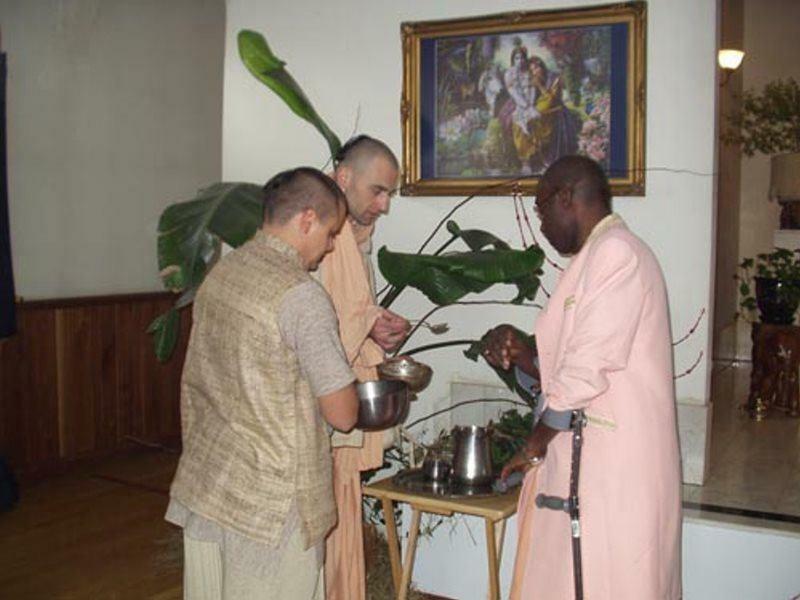 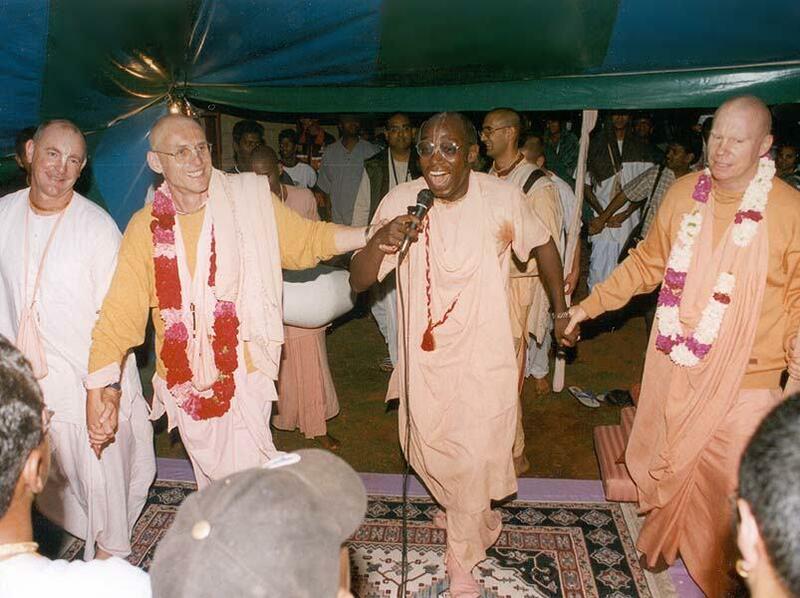 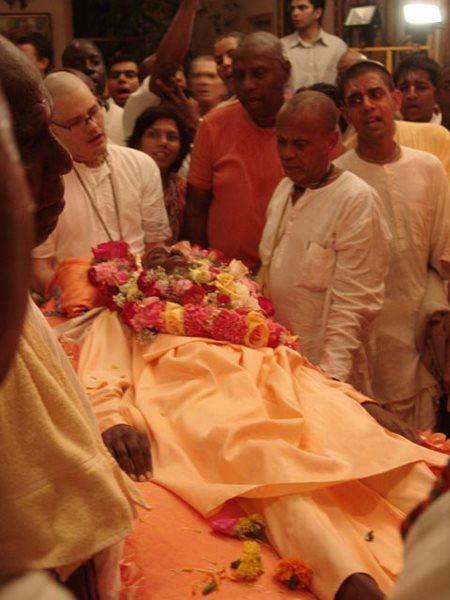 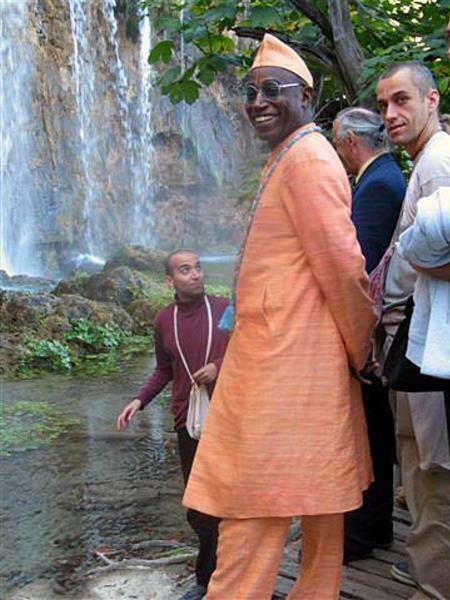 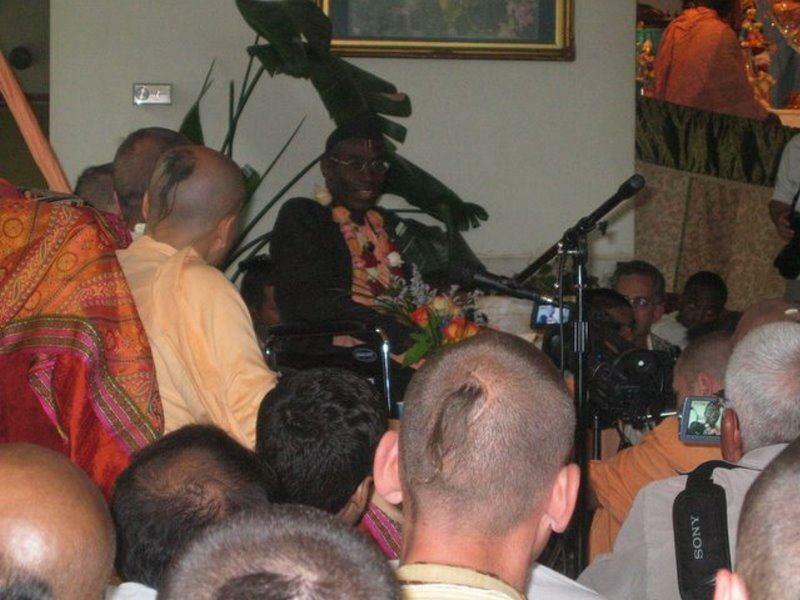 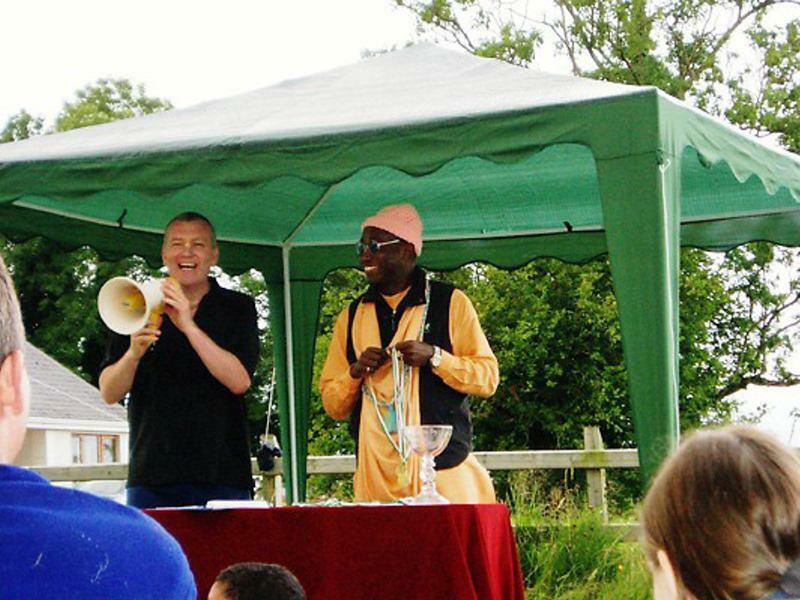 In the same year, he became the first devotee of the Hare Krishna Movement to visit Nigeria and preach there. 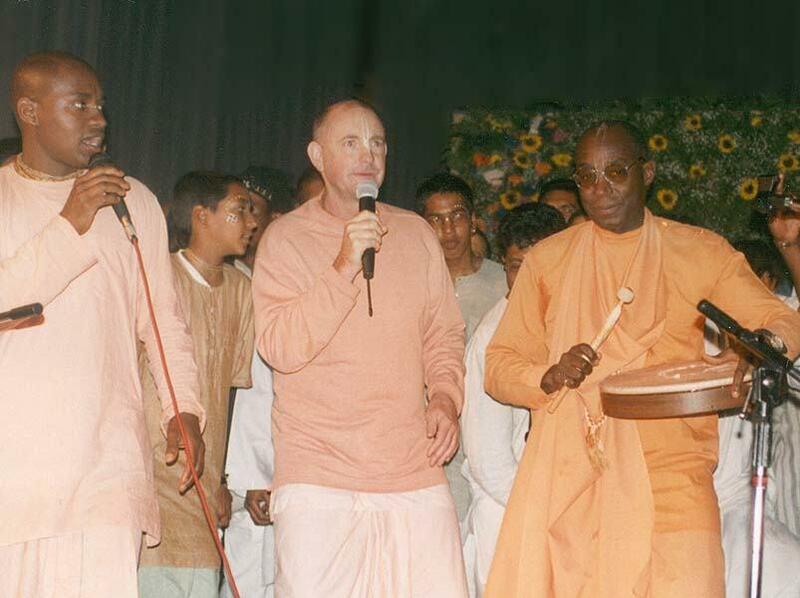 Later he went on to become a senior leader and one of the most prominent preachers within ISKCON and a member of its management body known as the Governing Body Commission. 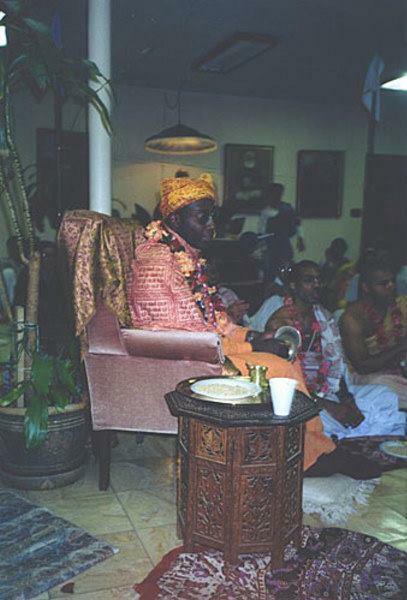 He was the first person of African descent to become an initiating guru in the disciplic succession of the ancient Brahma-Madhva-Gaudiya Sampradaya. 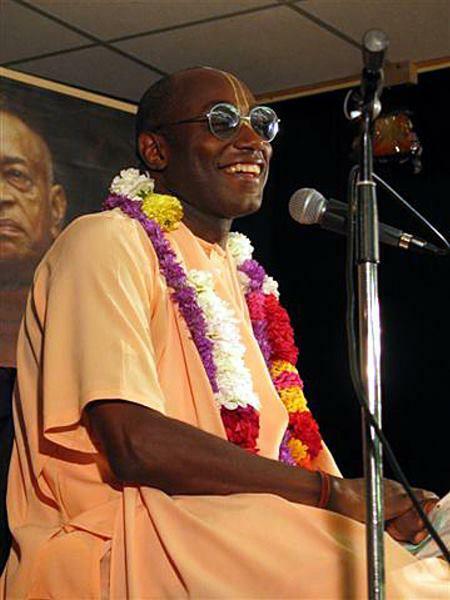 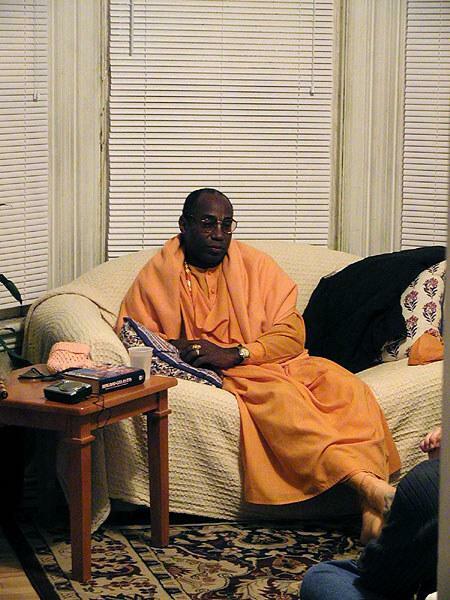 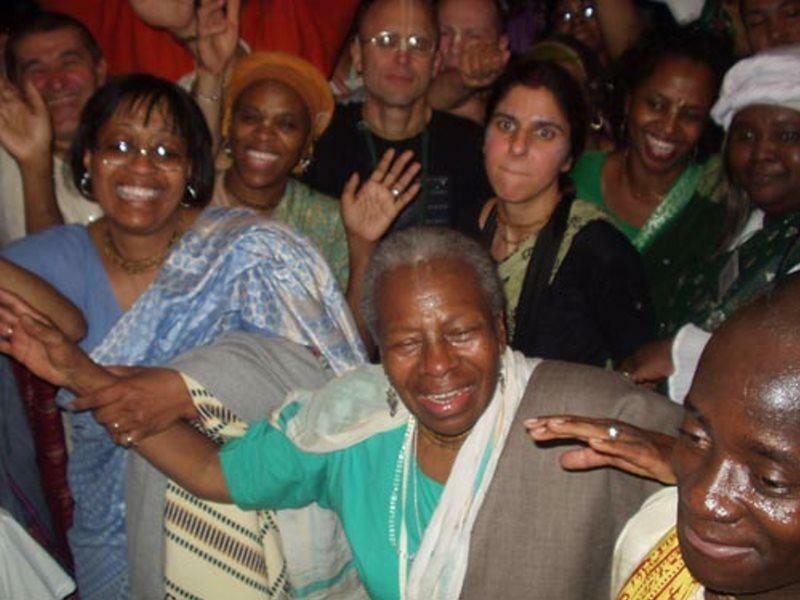 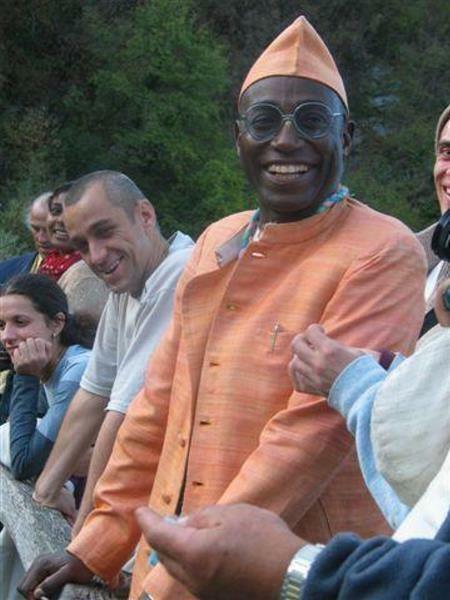 As a religious leader, Bhakti-tirtha Swami made a friendship with celebrities and served as a spiritual consultant, specializing in international relations and conflict resolution to high ranking members of the United Nations and world leaders, including former President of South Africa Nelson Mandela. 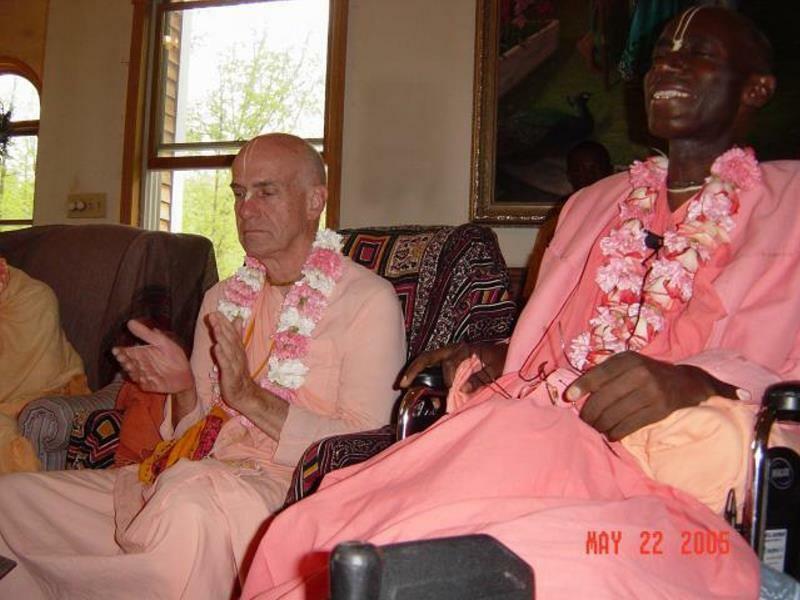 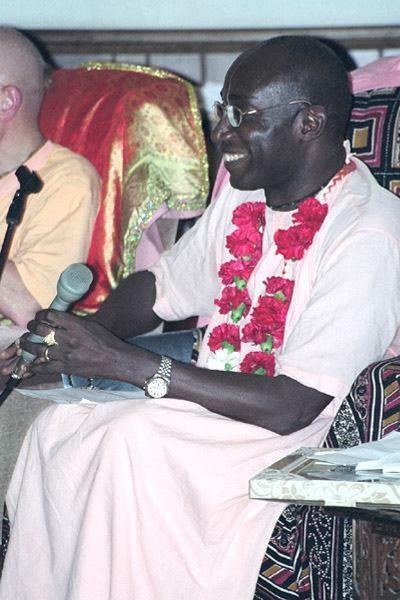 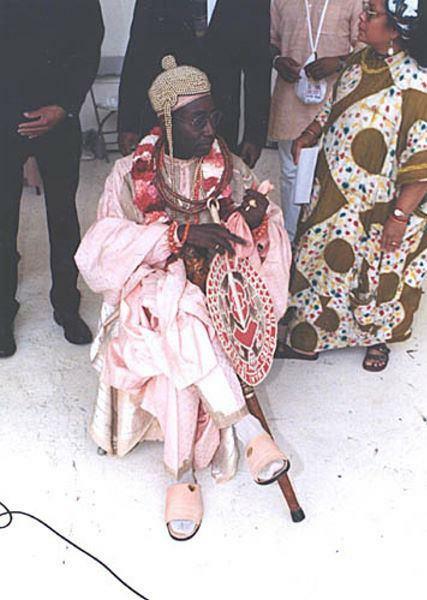 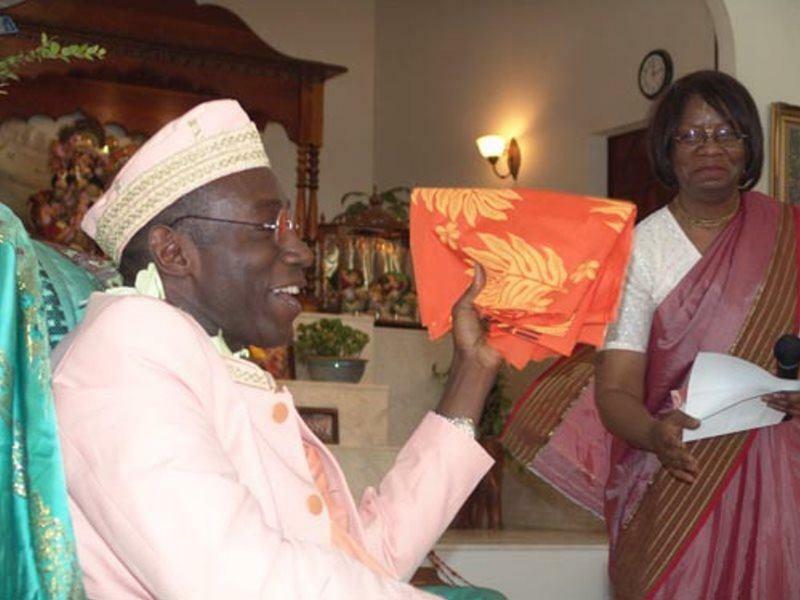 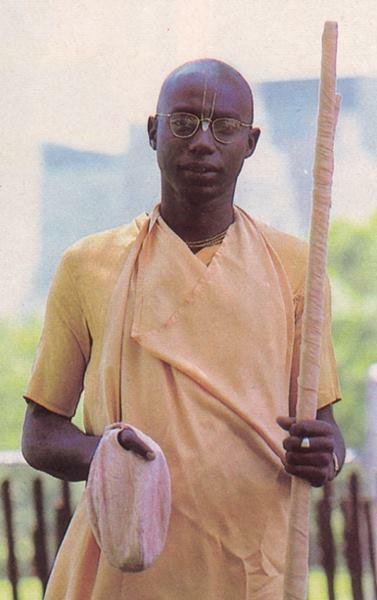 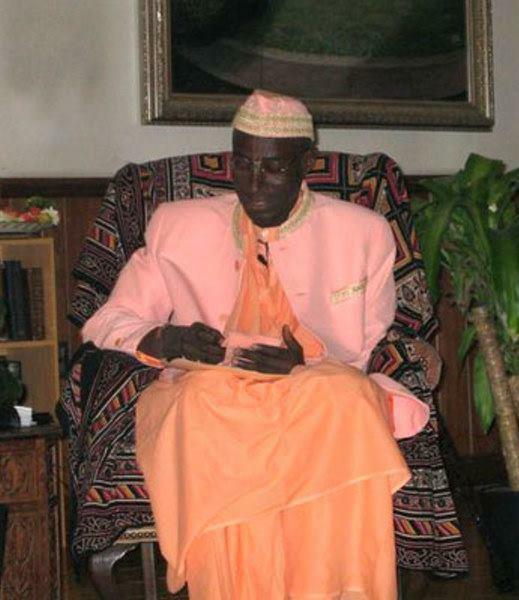 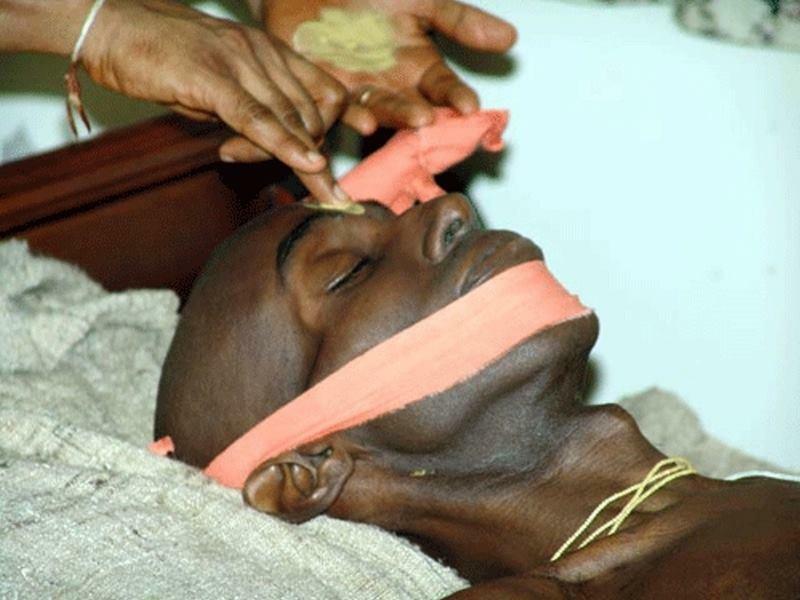 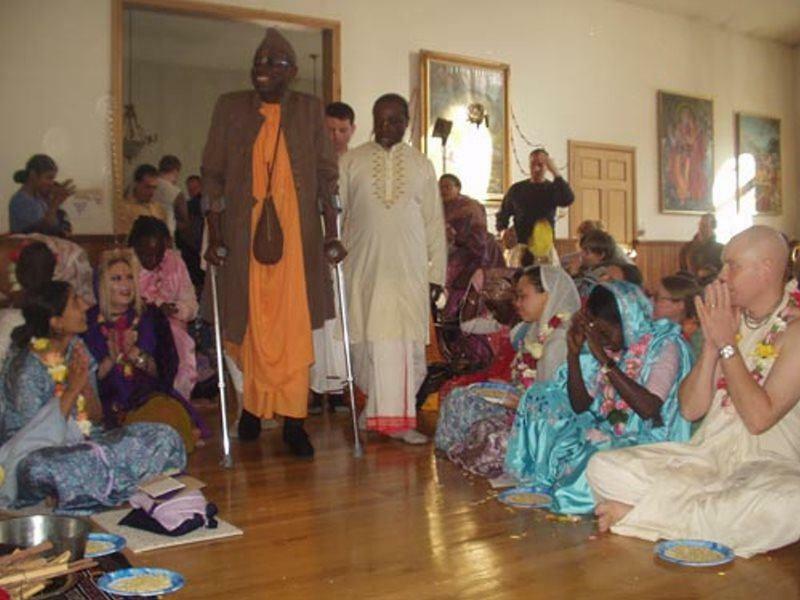 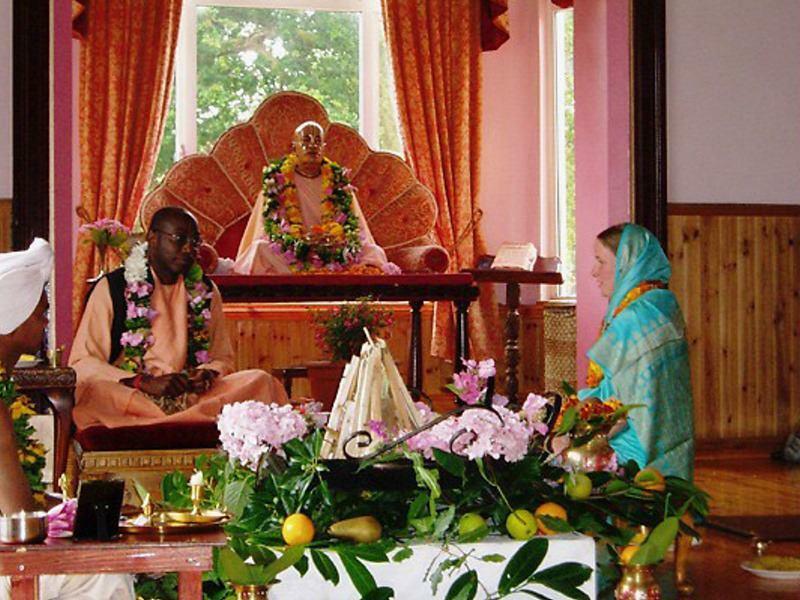 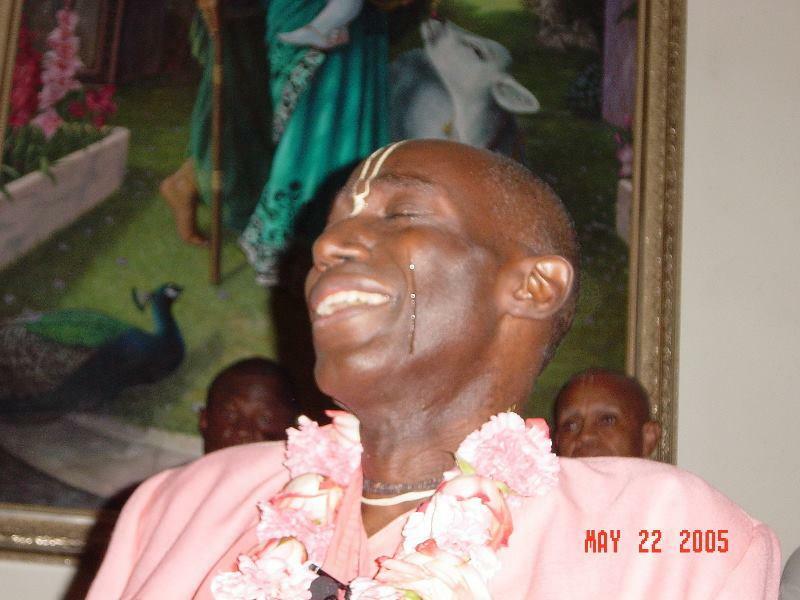 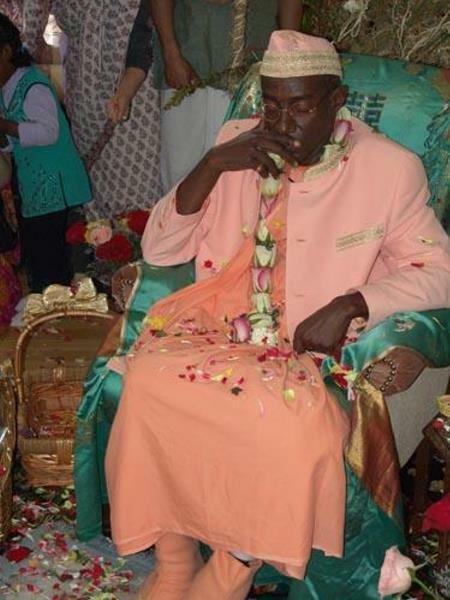 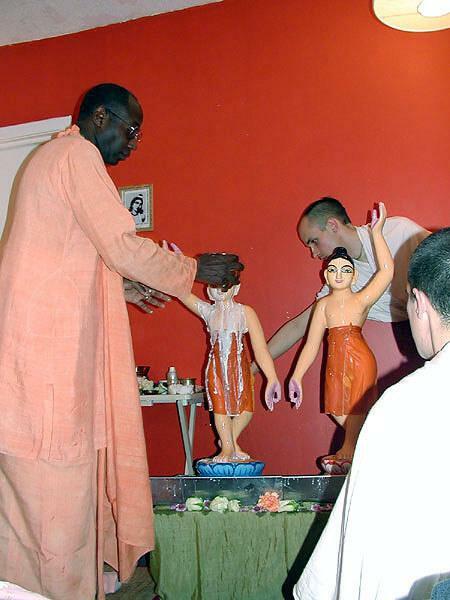 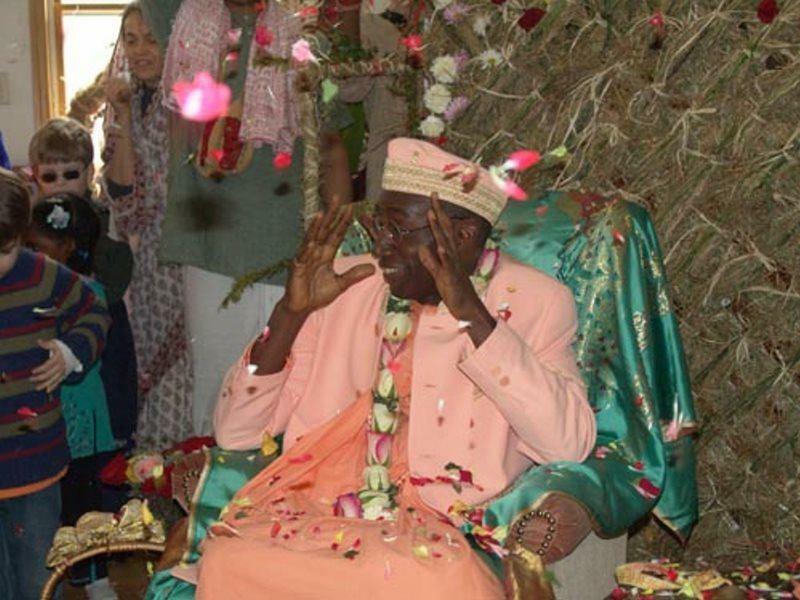 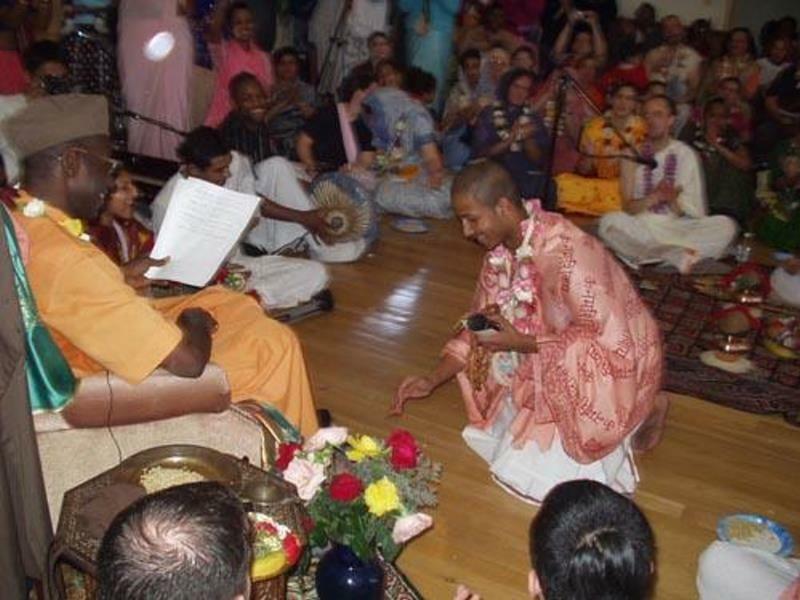 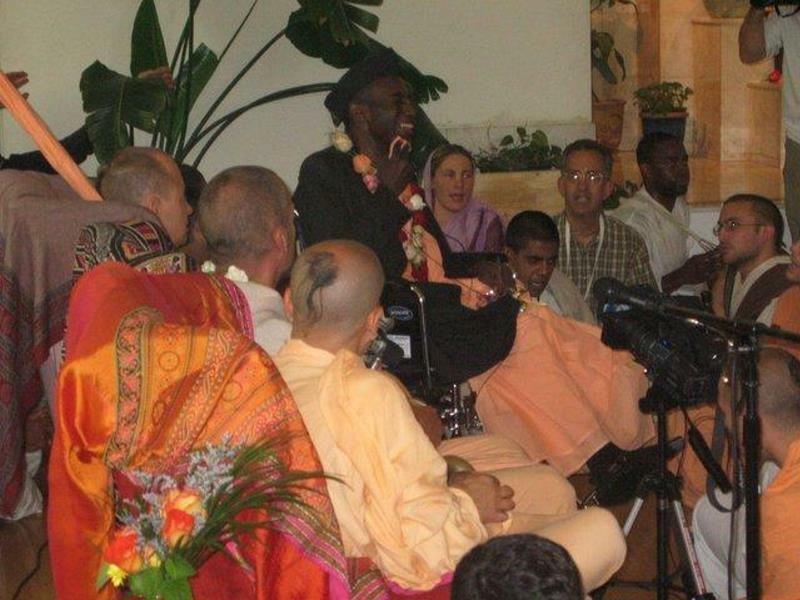 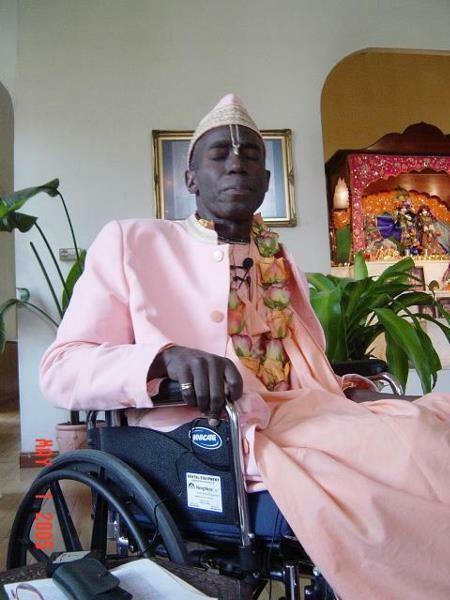 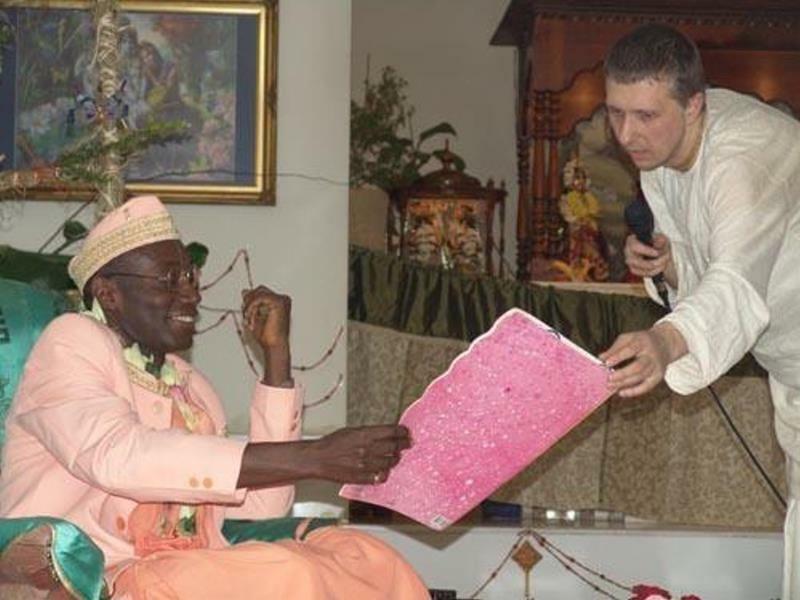 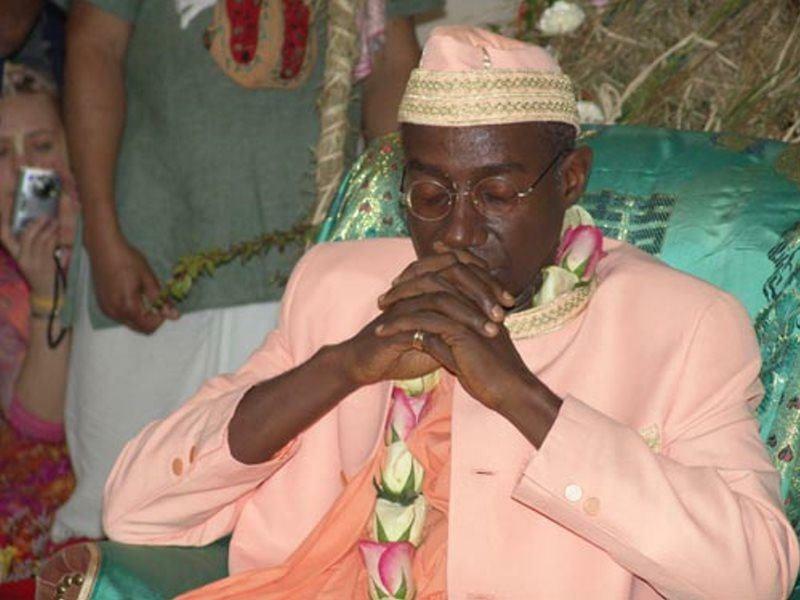 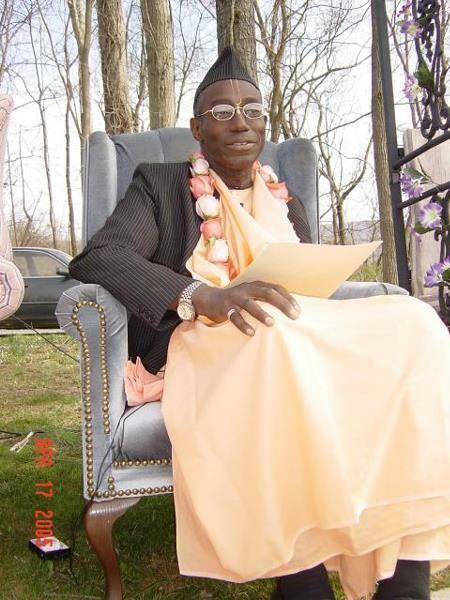 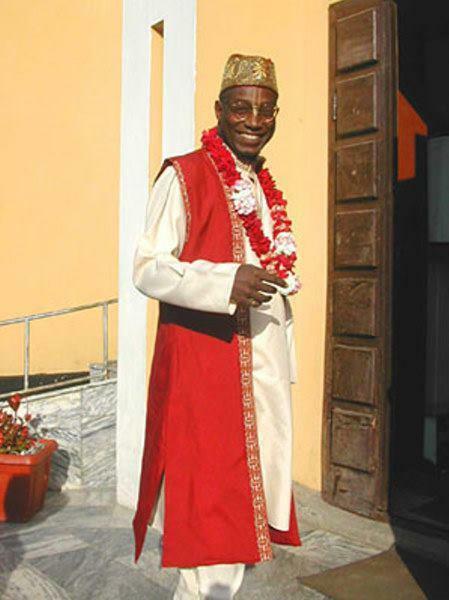 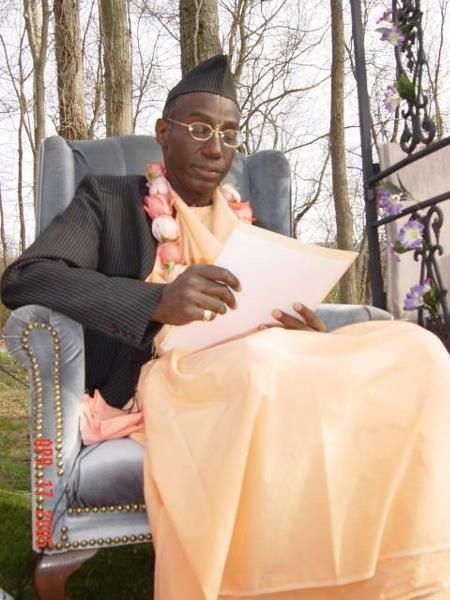 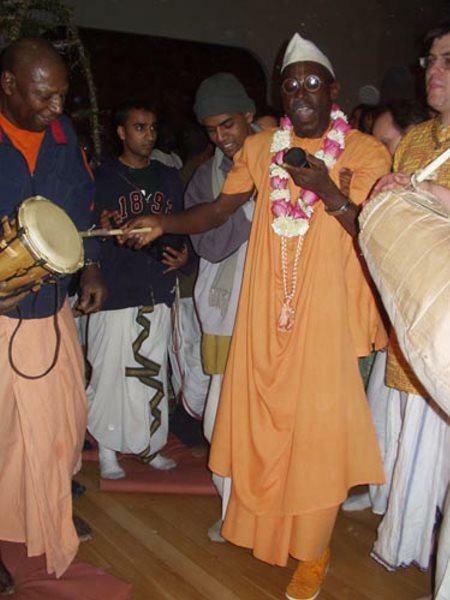 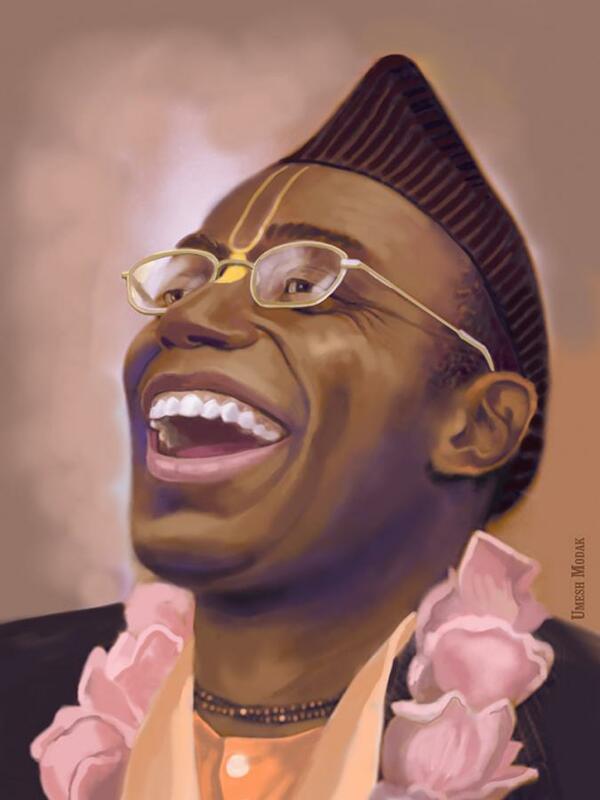 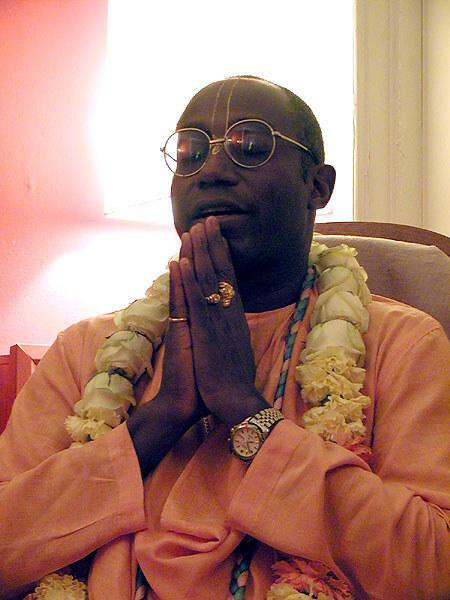 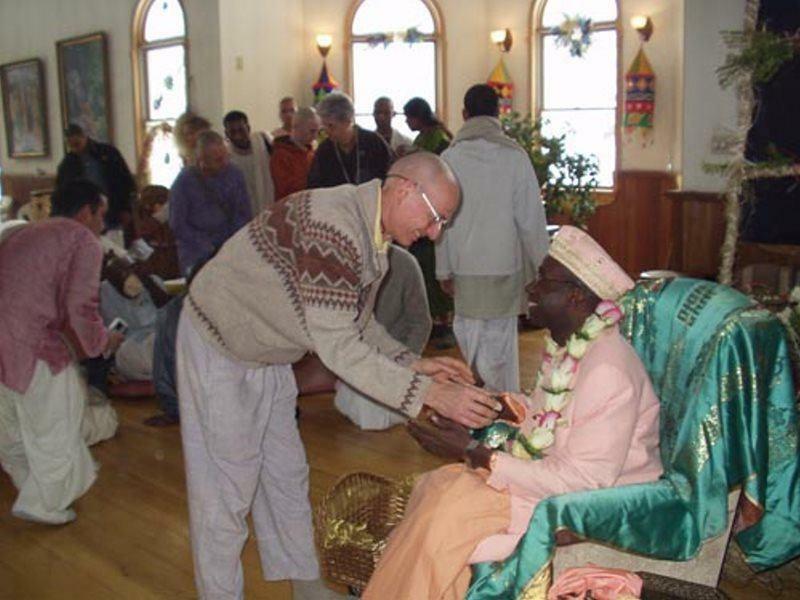 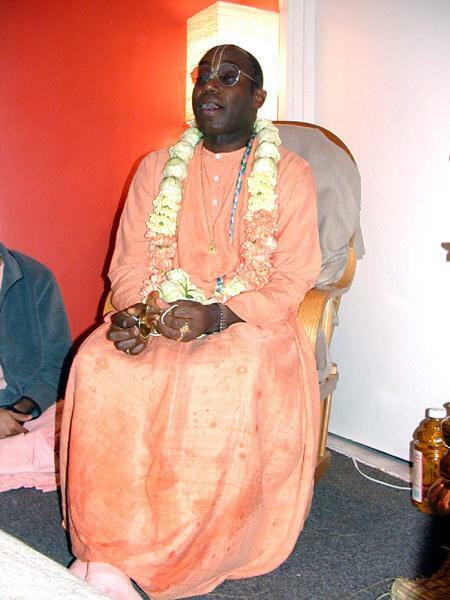 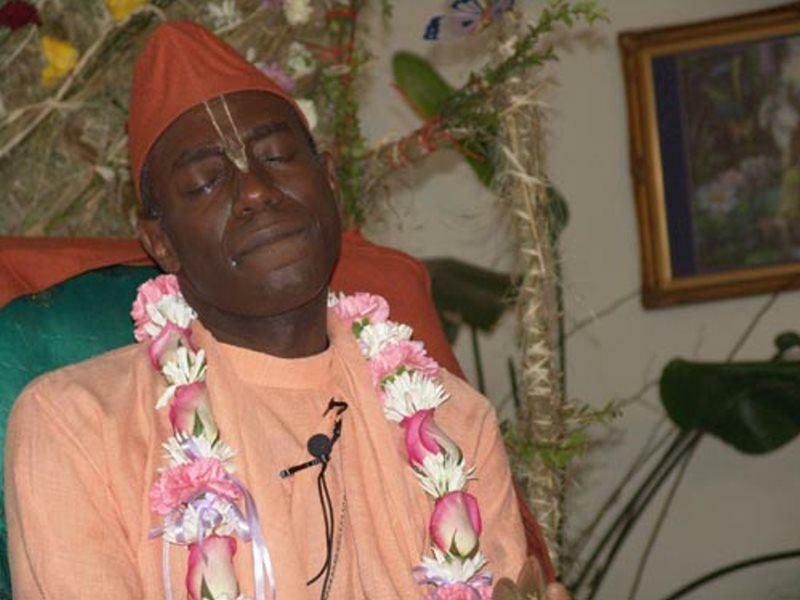 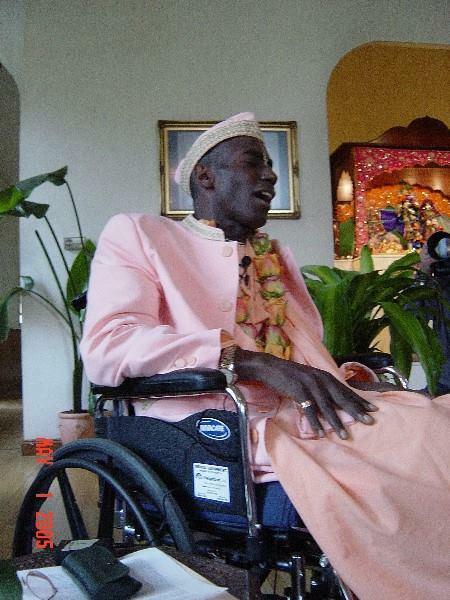 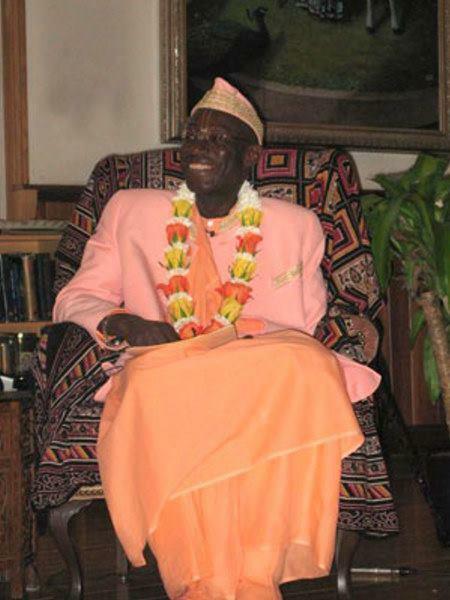 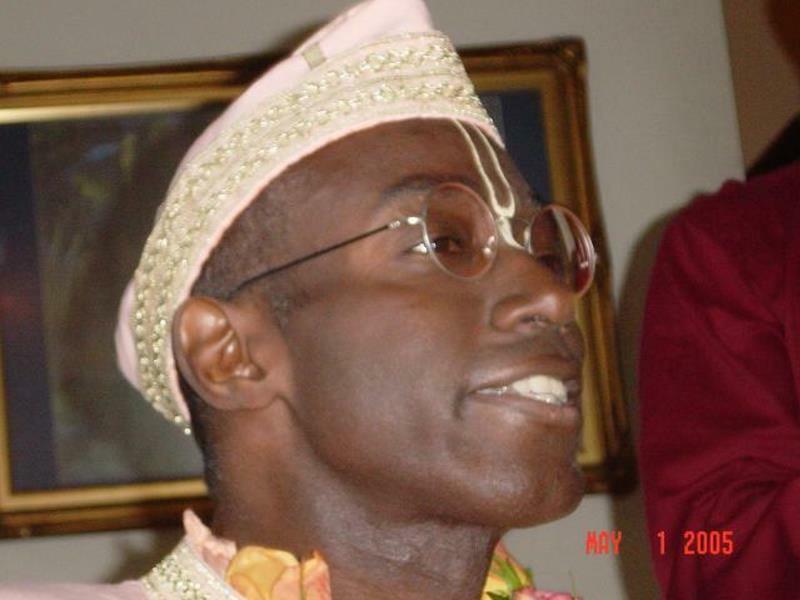 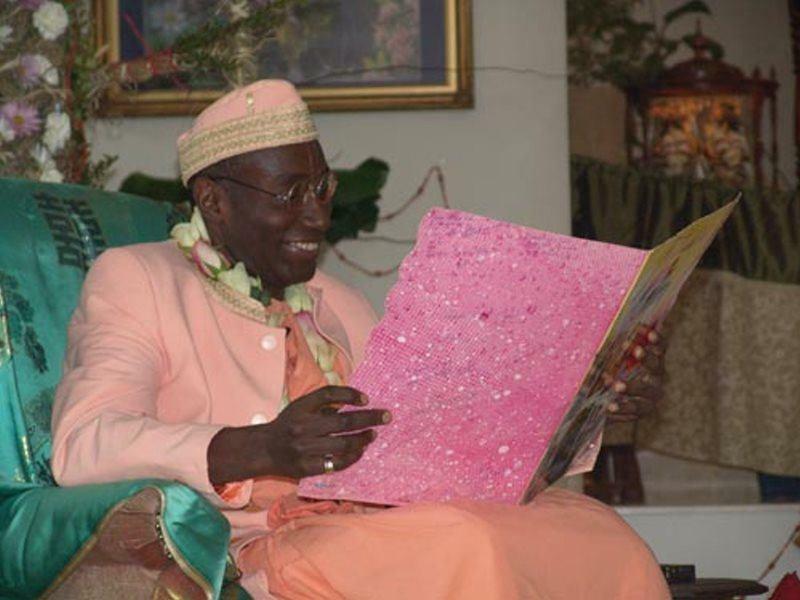 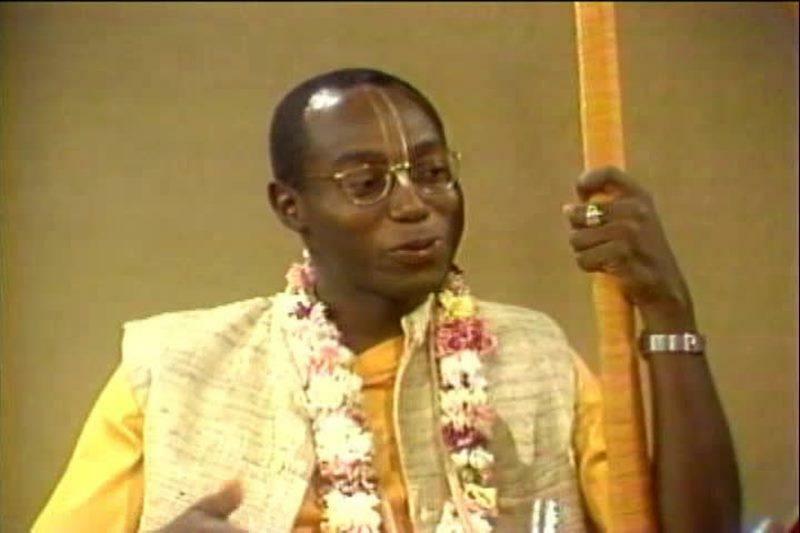 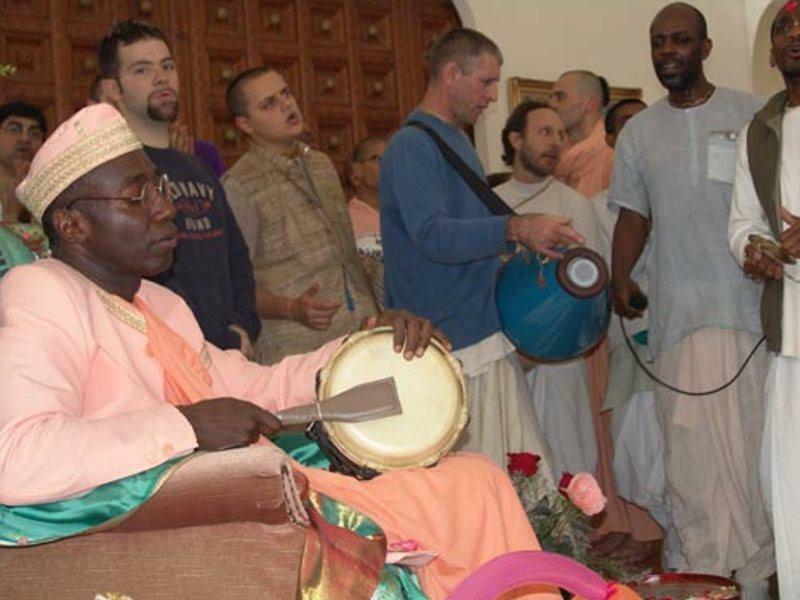 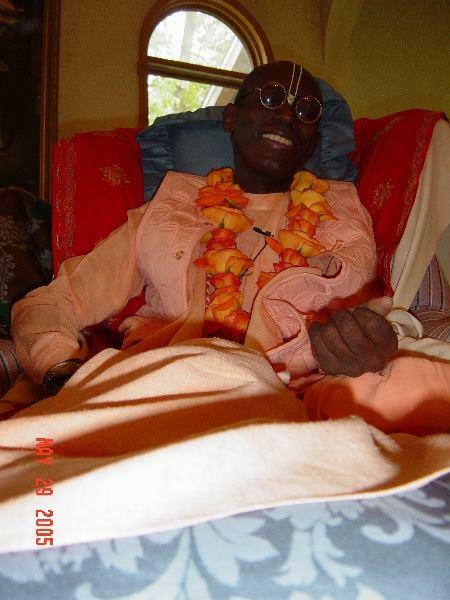 In 1990 Bhakti Tirtha Swami was coronated High Chief in Warri, Nigeria, West Africa in recognition of his reputable work performed there. 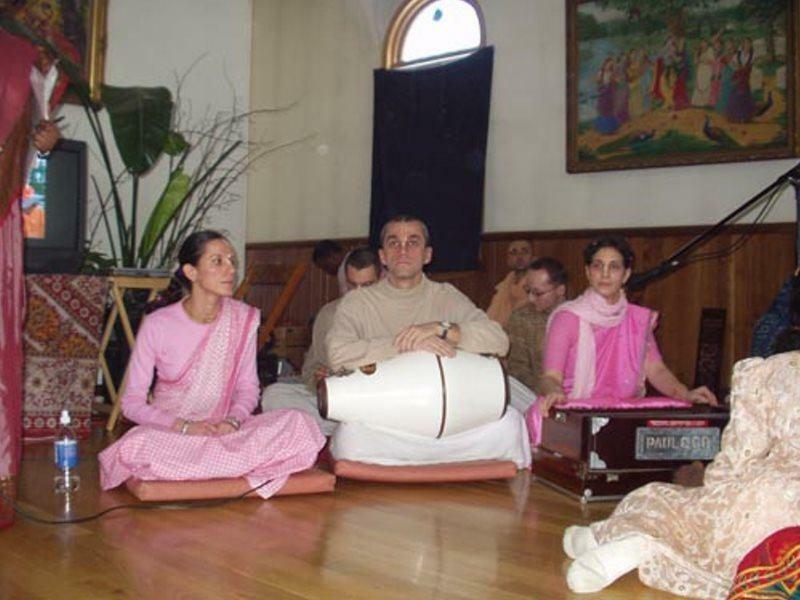 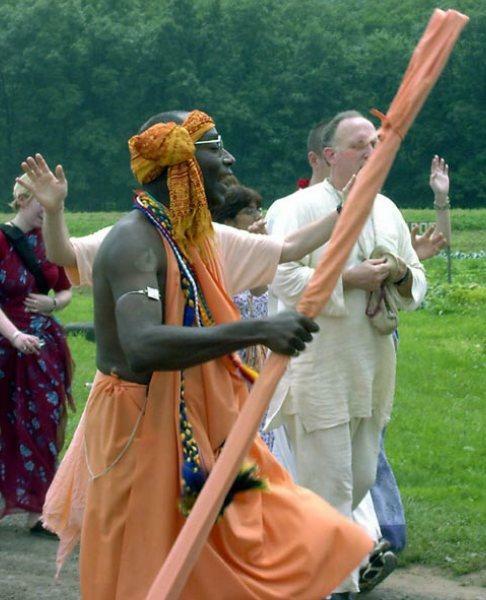 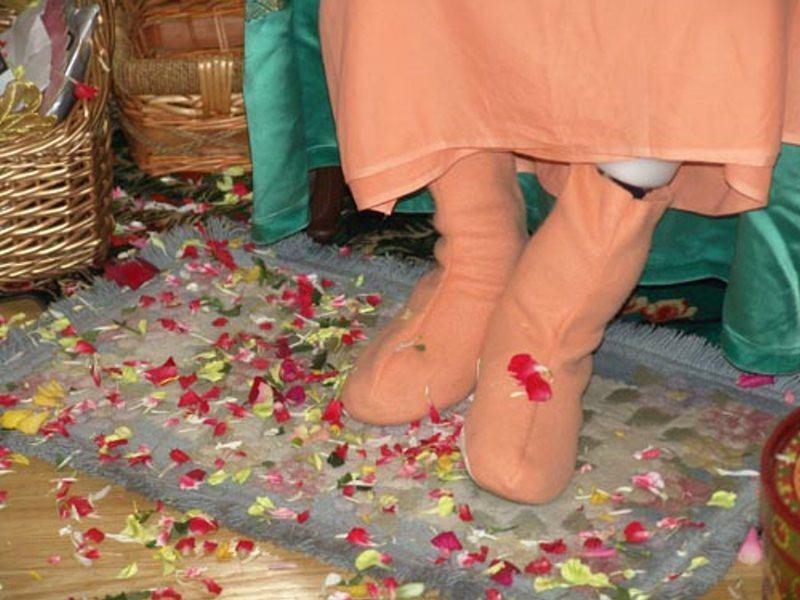 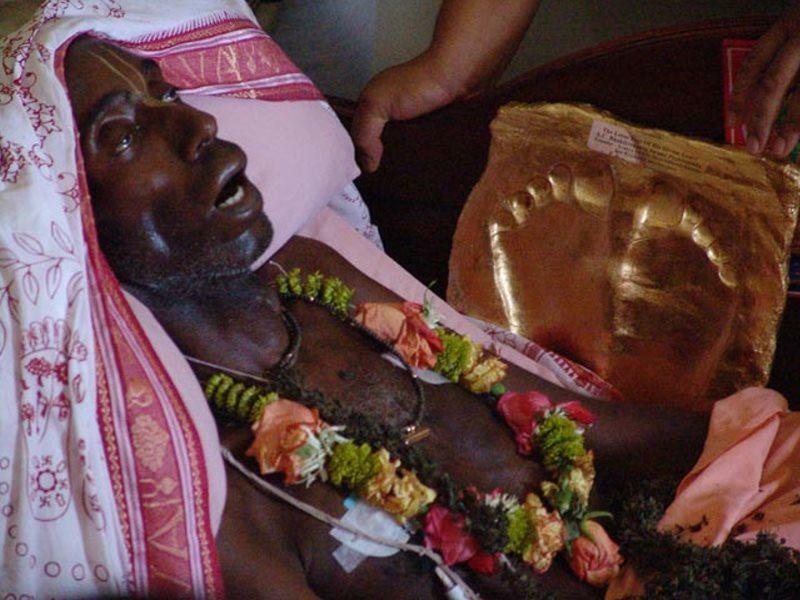 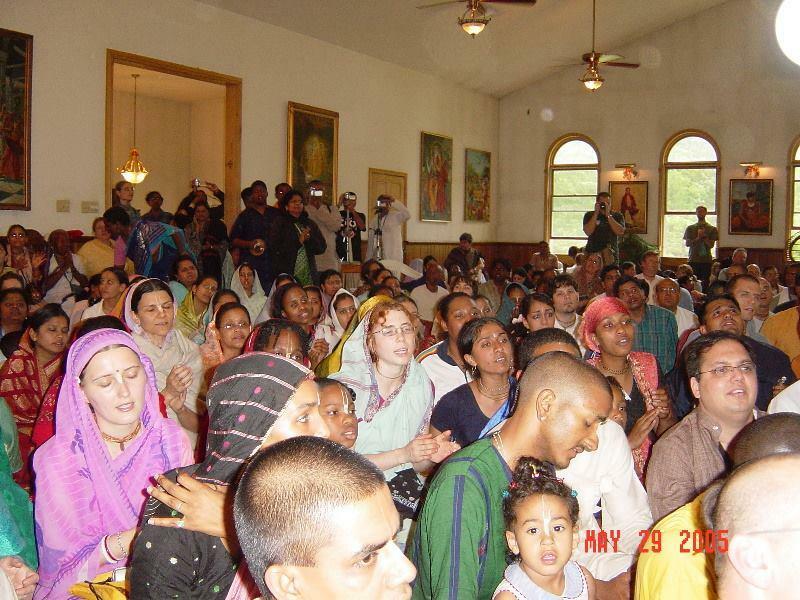 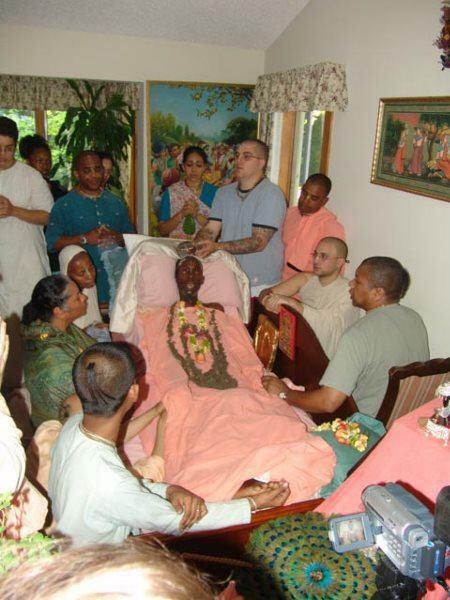 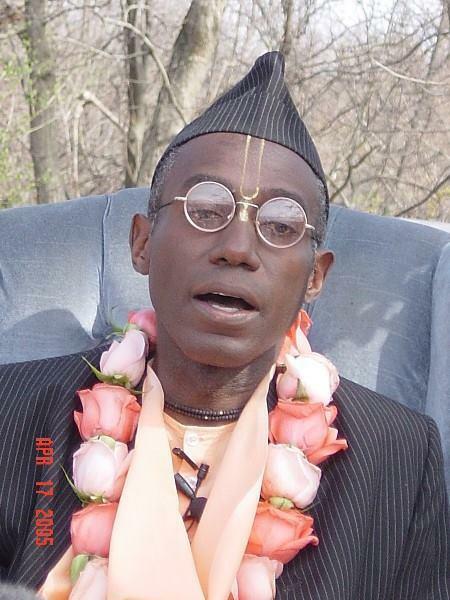 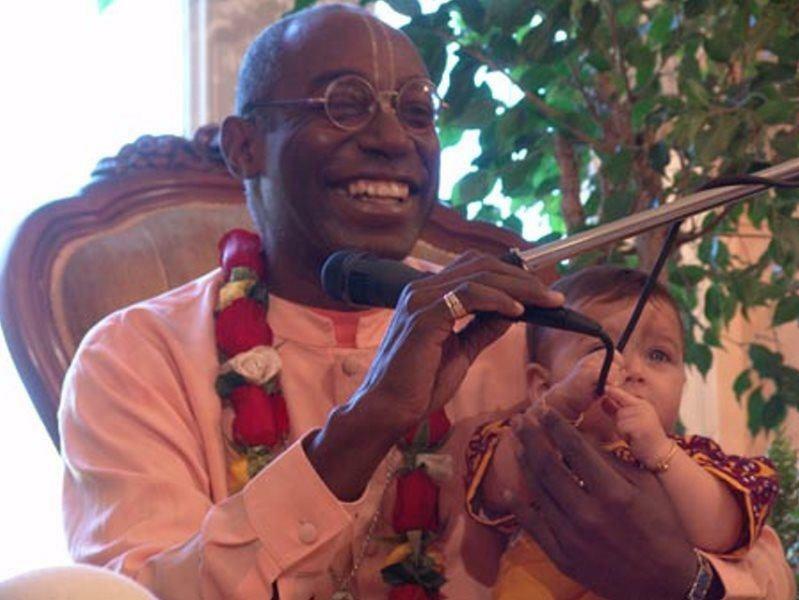 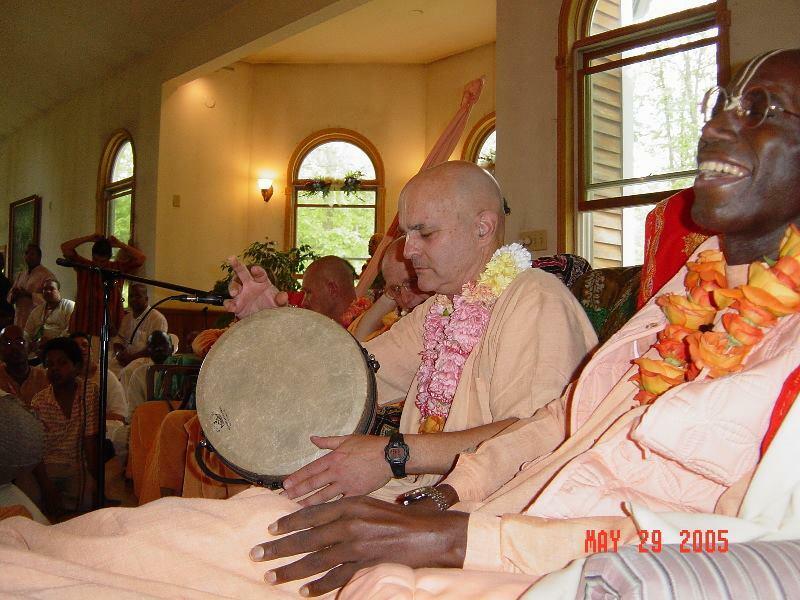 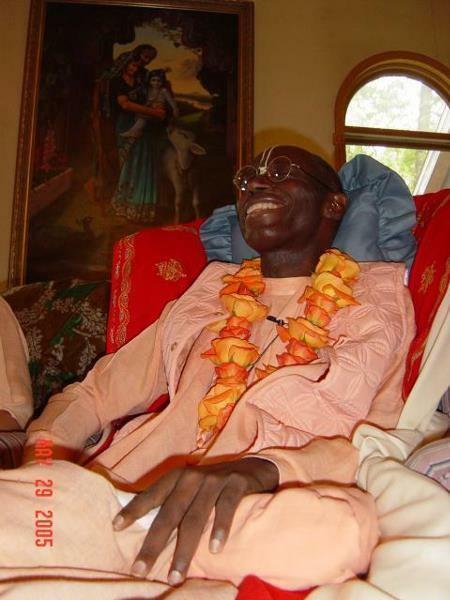 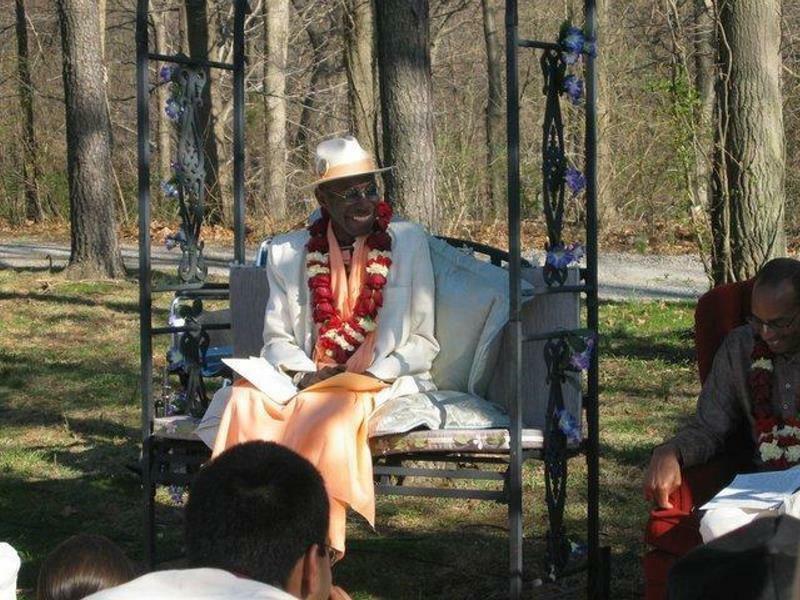 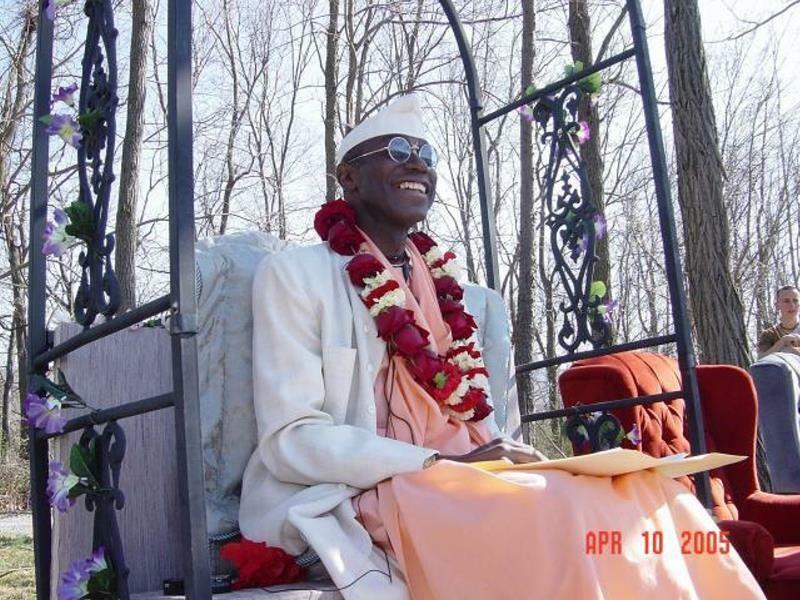 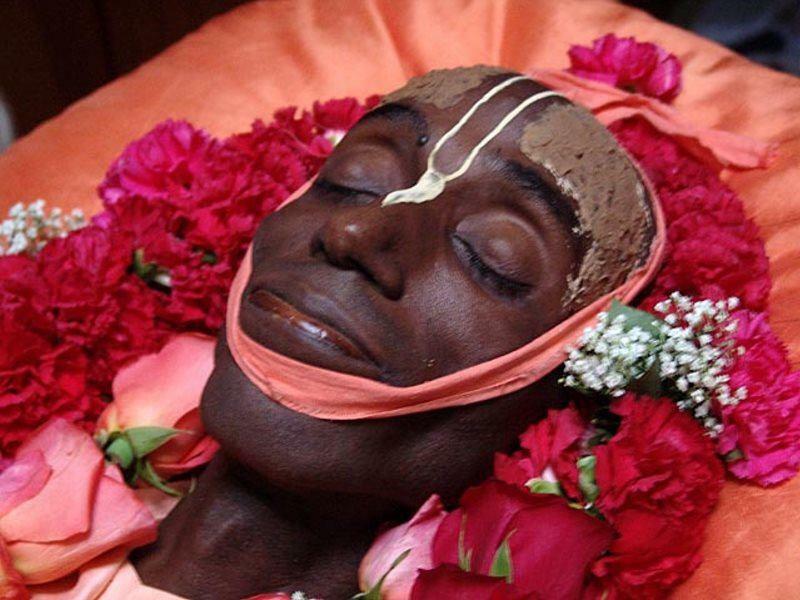 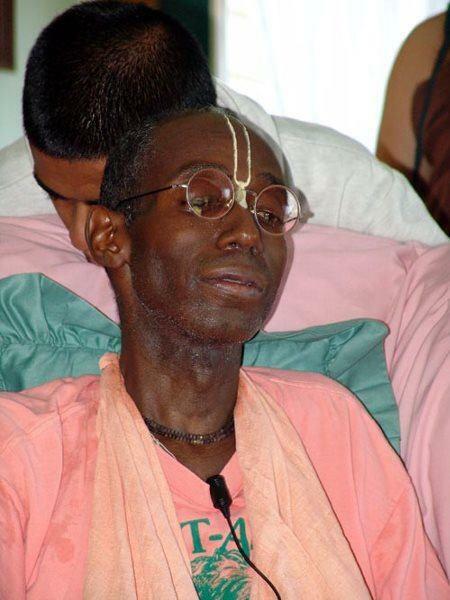 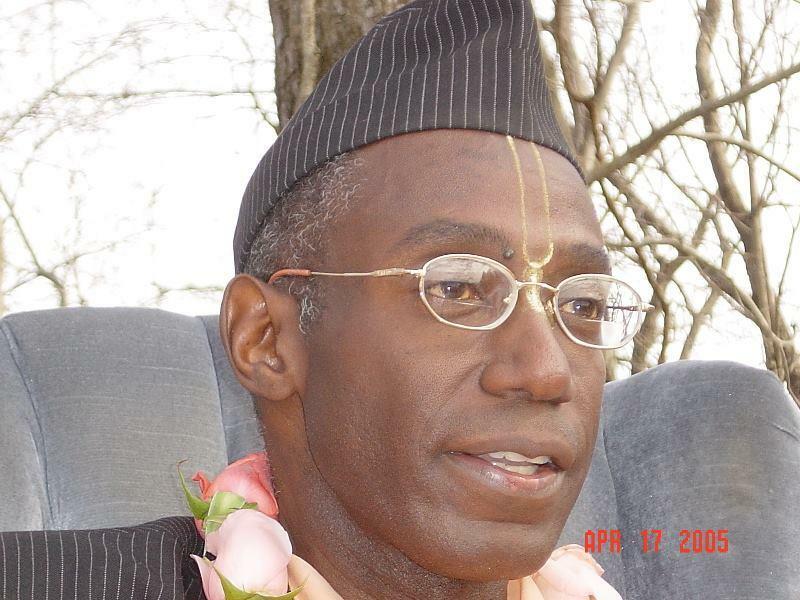 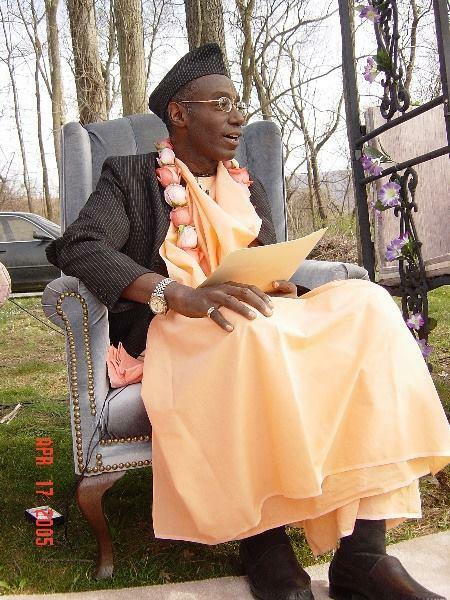 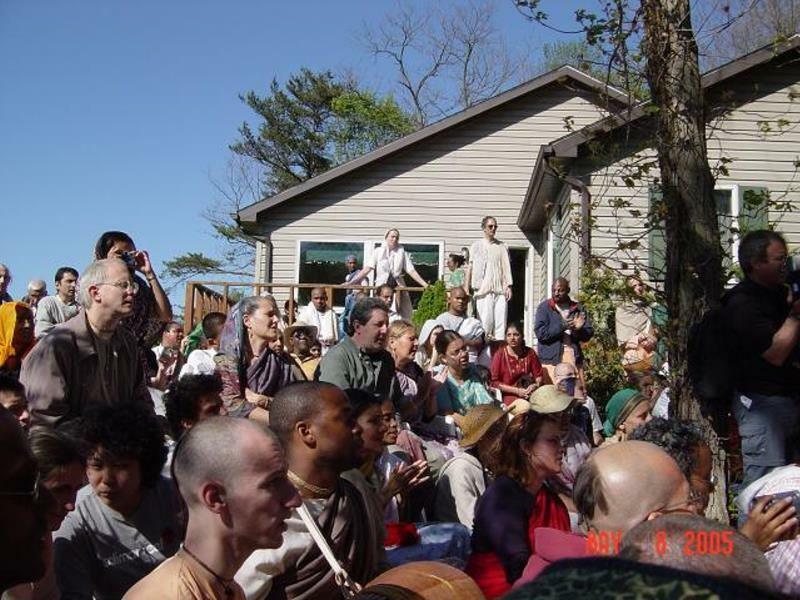 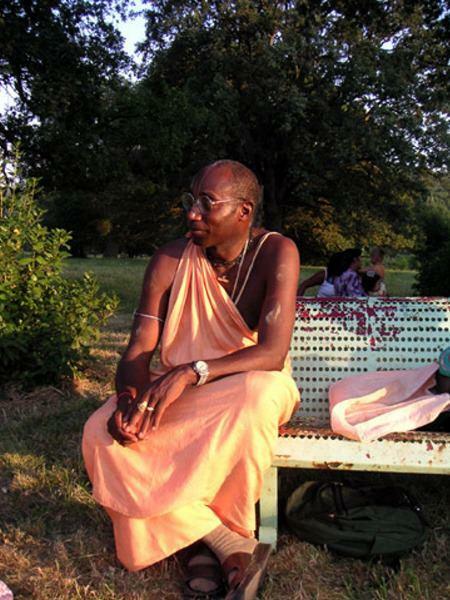 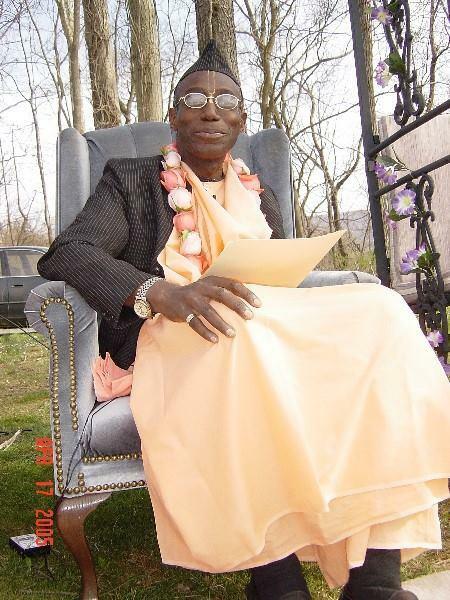 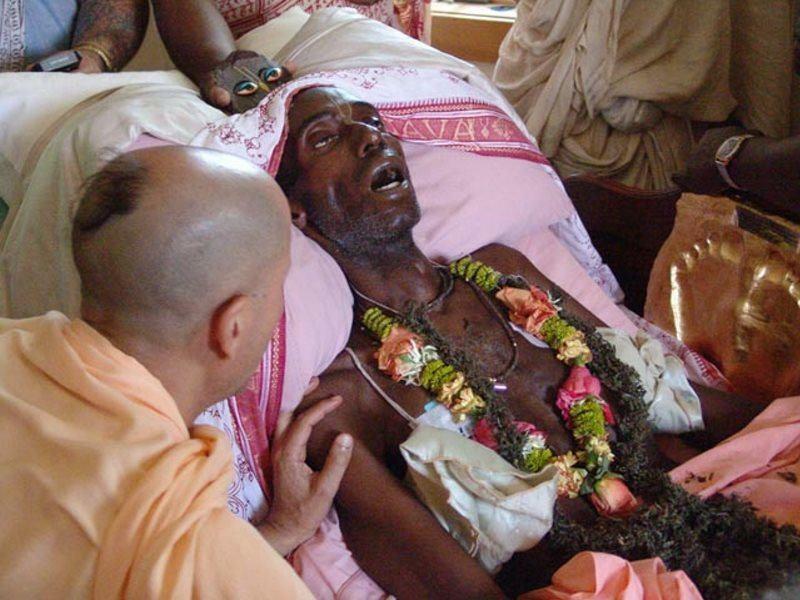 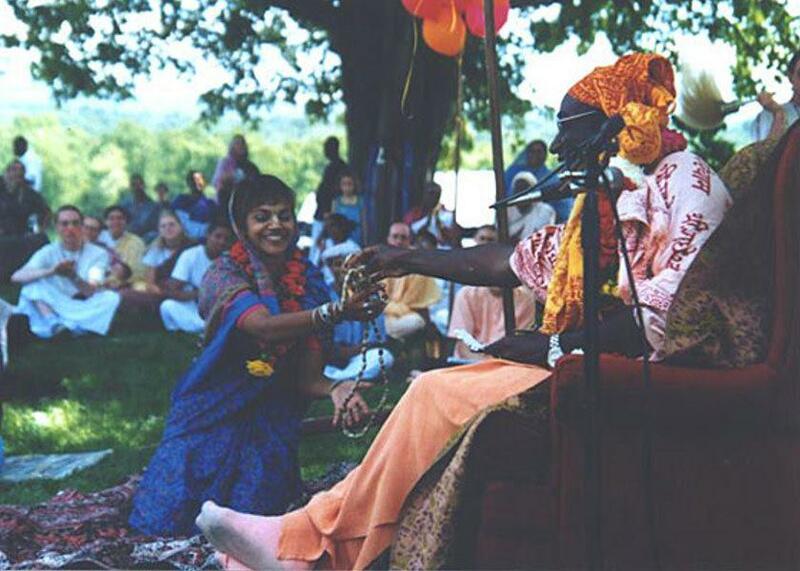 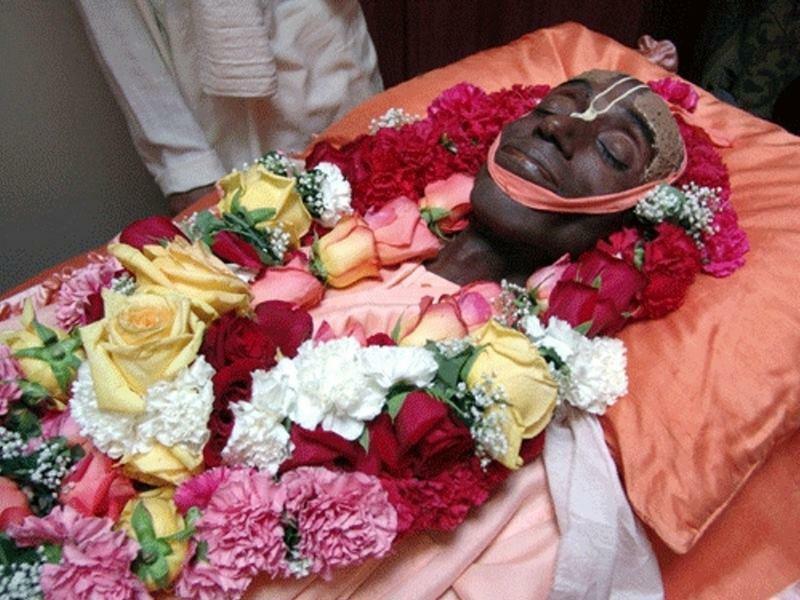 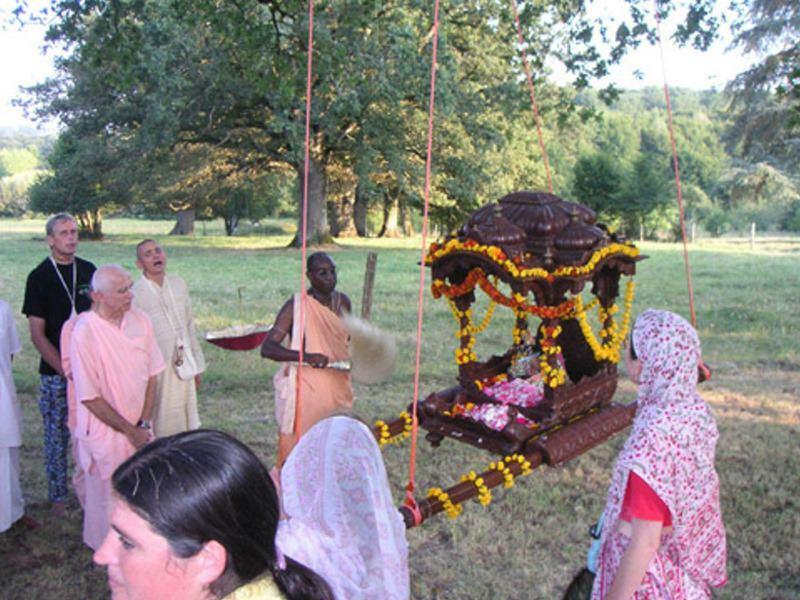 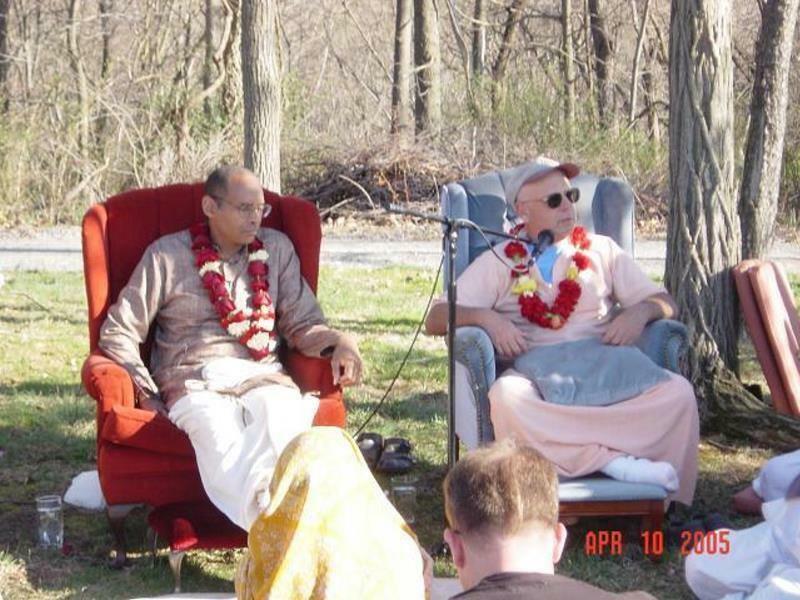 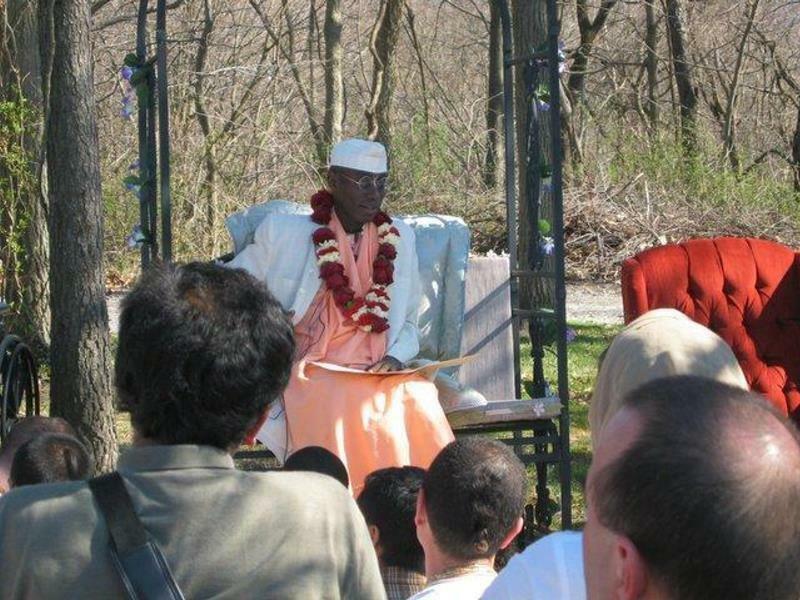 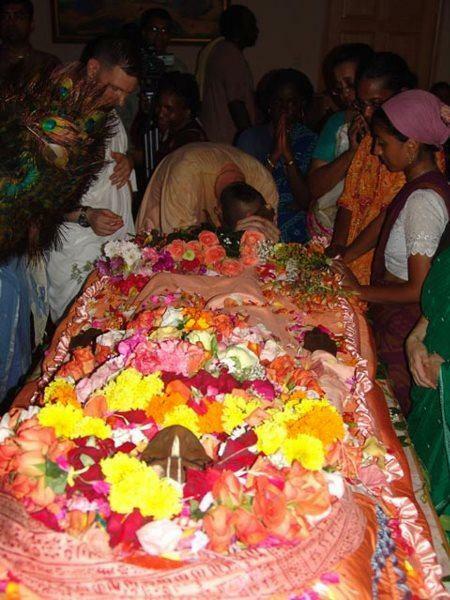 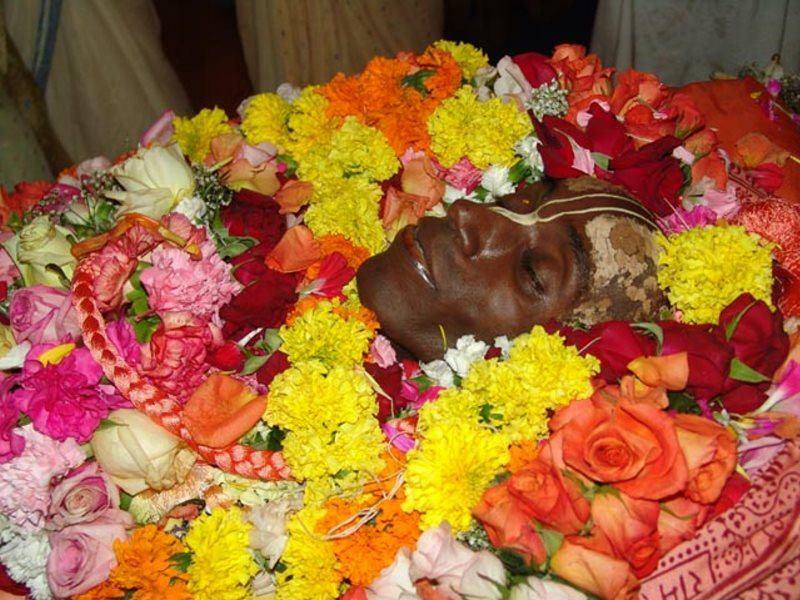 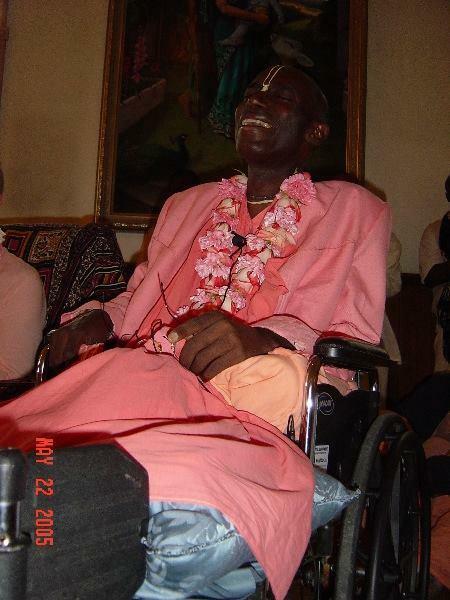 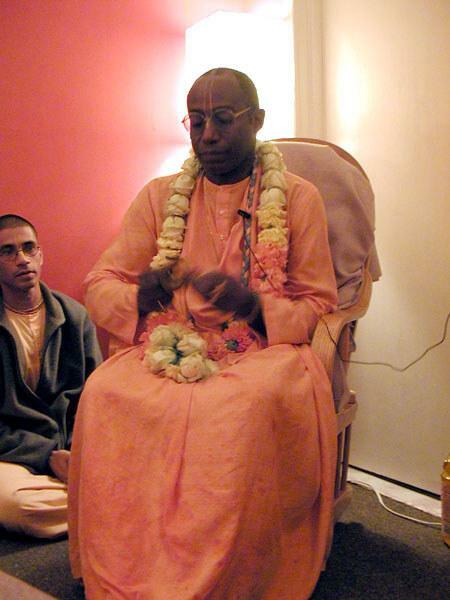 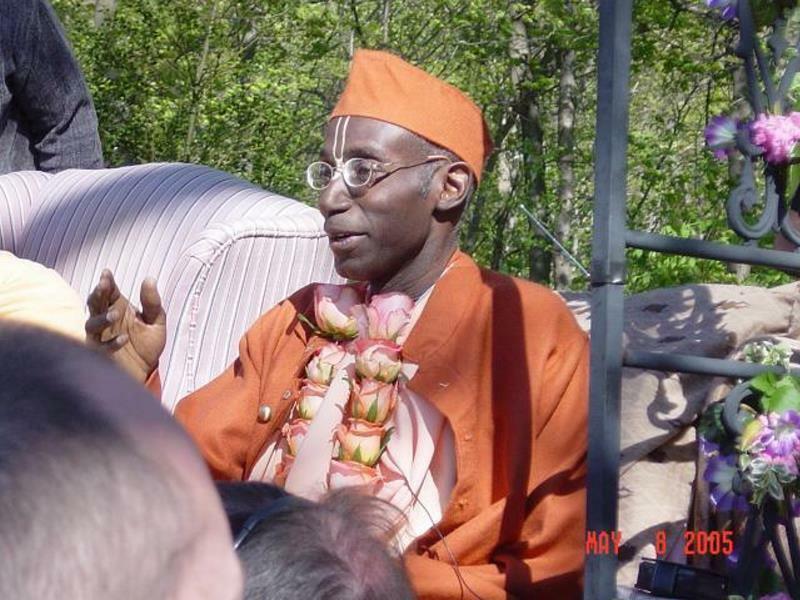 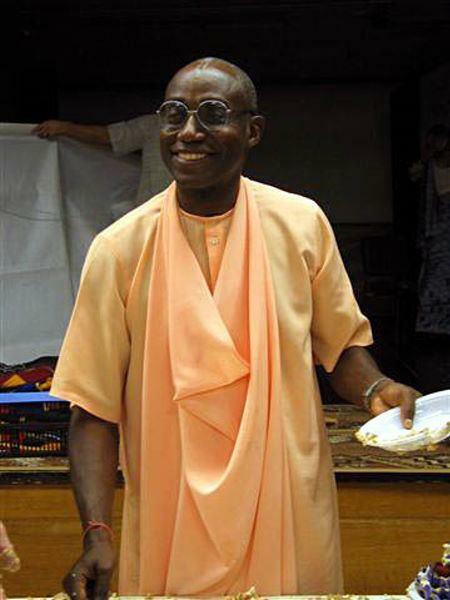 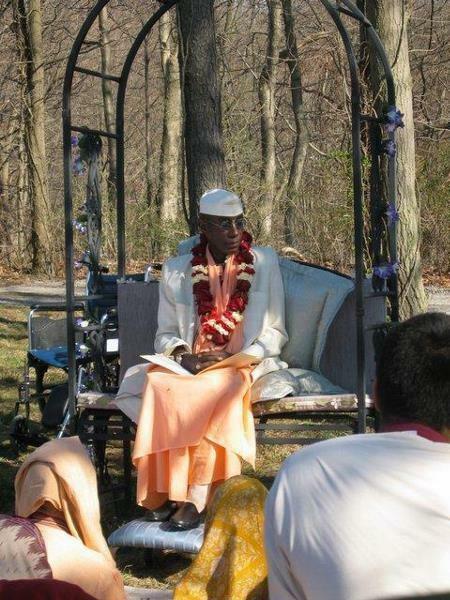 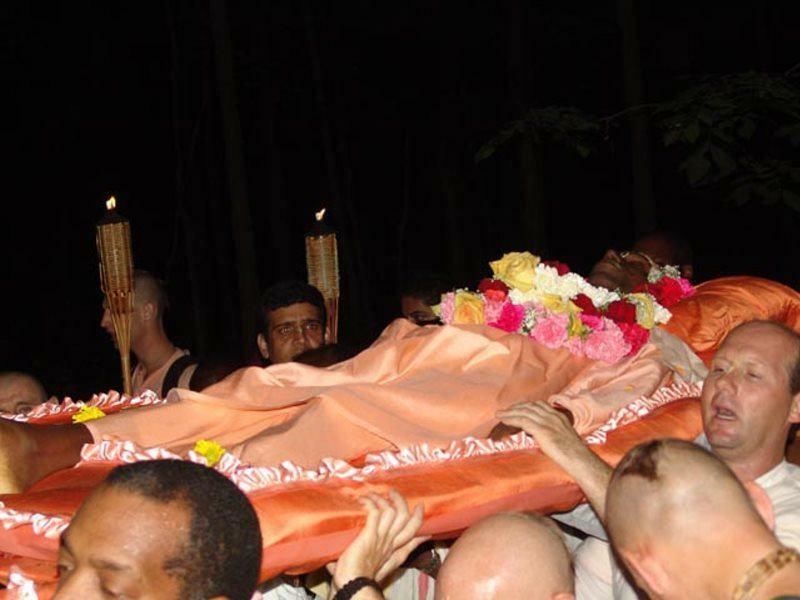 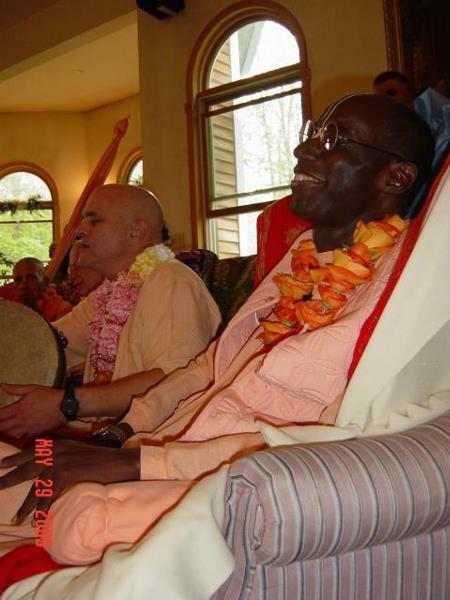 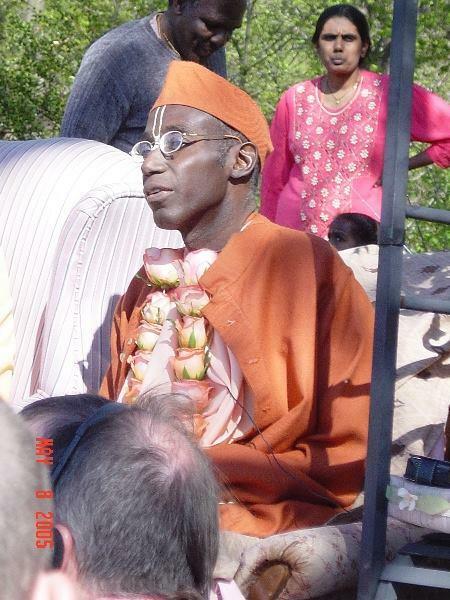 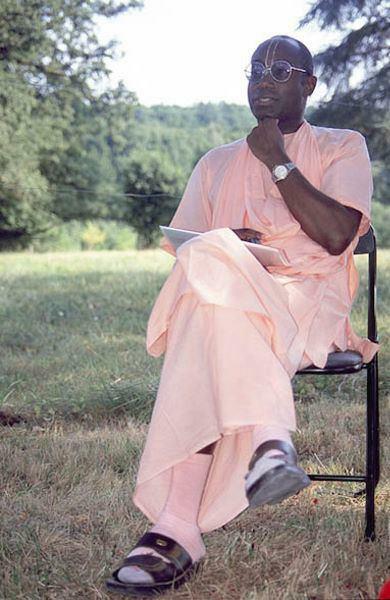 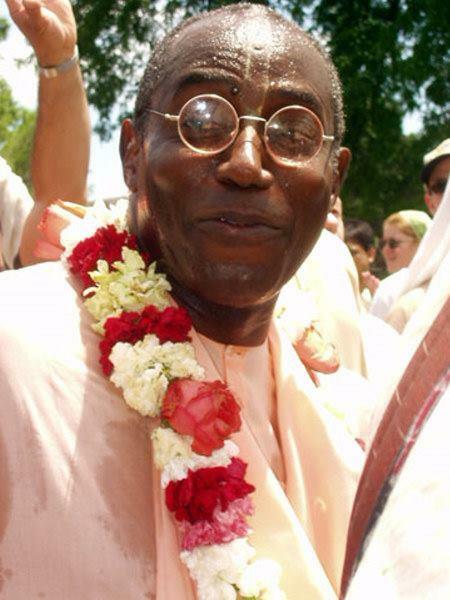 Bhakti Tirtha Swami died June 27, 2005, of complications frommelanoma, at Gita Nagari, the Gaudiya Vaishnava community in central Pennsylvania.